Henry Moore, Large Interior Form, 1982. Art Institute of Chicago. ART OUT OF DOORS. Photographs ©John P. Walsh. Henry Moore, Large Interior Form, 1982. North Stanley McCormick Memorial Court, Art Institute of Chicago. November 5, 2017. Large Interior Form (1982) by Henry Moore (British, 1898-1986). “Henry Moore’s towering 16-foot sculpture Large Interior Form is among his more mature works, made when the artist was concerned with the construction of three-dimensional space, internal forms within solid volumes, and placing his work in a natural setting. Early in his career, Moore worked primarily in stone but shifted to modeling and bronze casting once these formal concerns took hold. Large Interior Form plays with mass and void, gravity and growth…and juxtaposes its natural-looking shape with its man-formed substance.” (see http://www.artic.edu/north-stanley-mccormick-memorial-court – retrieved July 9, 2018). 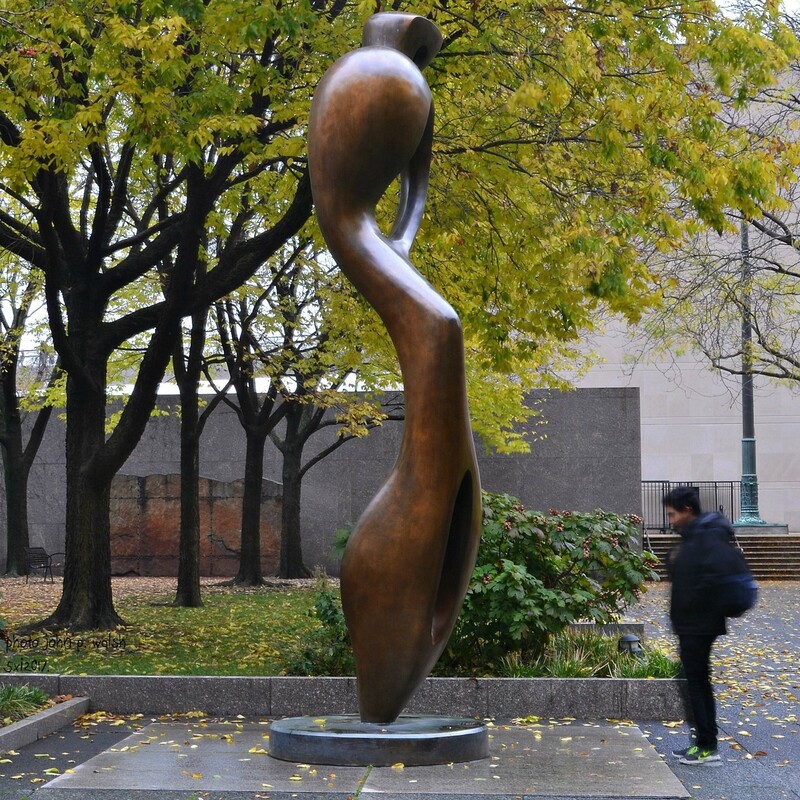 This entry was posted in ART OUT OF DOORS, ARTIST, British art, CHICAGO, My Photography and tagged Art Institute of Chicago, Henry Moore, Large Interior Form 1982, North Stanley McCormick Memorial Court on July 9, 2018 by jwalsh2013. Hans Holbein the Younger (German, 1497-1543): Humanist Portraits in England, 1526 to 1528. Featured Image: Self-Portrait, Hans Holbein the Younger, 1542/3, black and colored chalks, 23 x 18 cm, Florence, Galleria degli Uffizi. This is the only secure self portrait in the Holbein oeuvre. 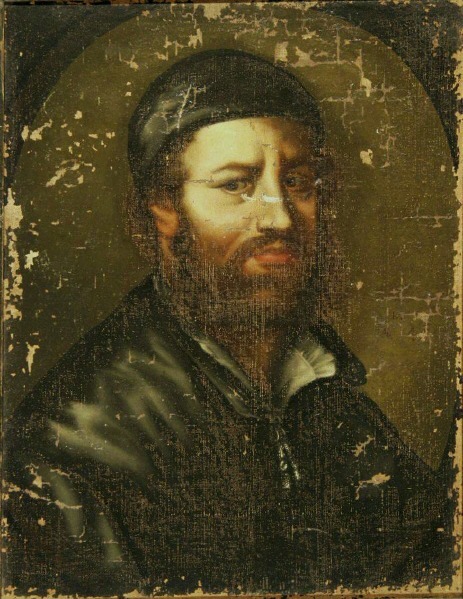 Self-portrait Hans Holbein The Younger, Oil on paper, mounted on oak, 16.5 x 14 cm, inscribed on the left and right of the head: H H; on the left above the shoulder: AN [N] O. 1554 / ETATIS SVE/45, Kunstmuseum Basel, donated by Prof. J.J. Bachofen-Burckhardt Foundation in 2015. 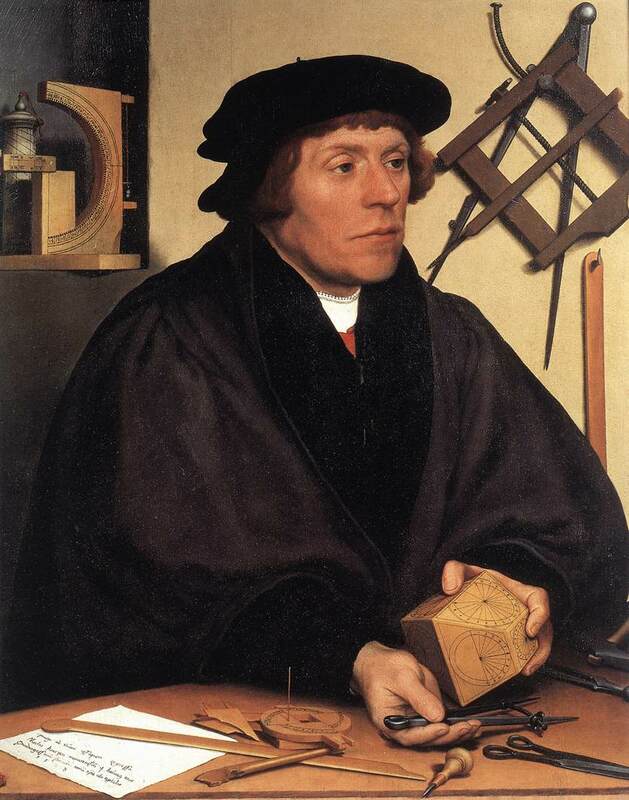 While Lüdin was probably working from a graphic reproduction, the unknown painter of this picture, if not Holbein’s own drawing, surely had one of the copies made shortly after his death in the narrow workshop environment. 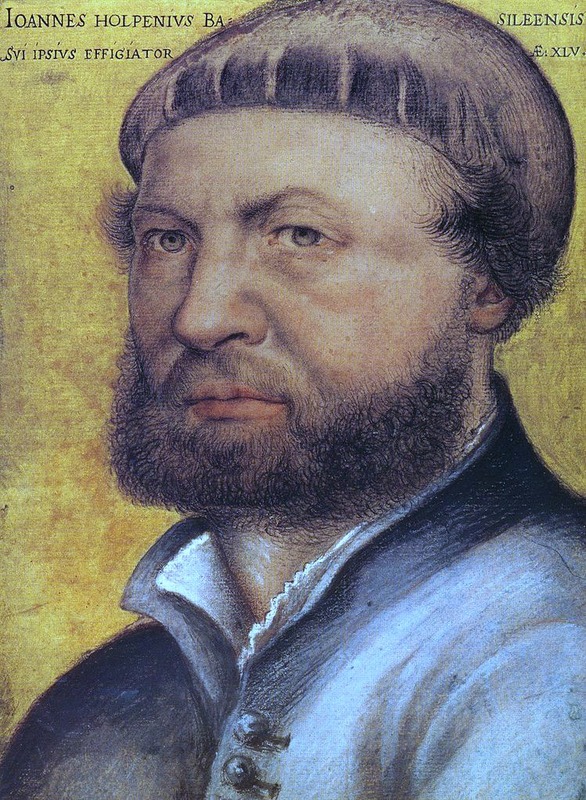 This is one more Hans Holbein self-portrait based on the secure Florentine drawing. Self-Portrait Hans Holbein, copy by Johannes Lüdin, c. 1647-1667, Oil on canvas, 61.5 x 47.5 cm, Kunstmuseum Basel. In fall 1526 twenty-nine-year-old Hans Holbein crossed the channel from Antwerp to England where the German immigrant’s first concerns were to find work, useful friends, and a place to stay. 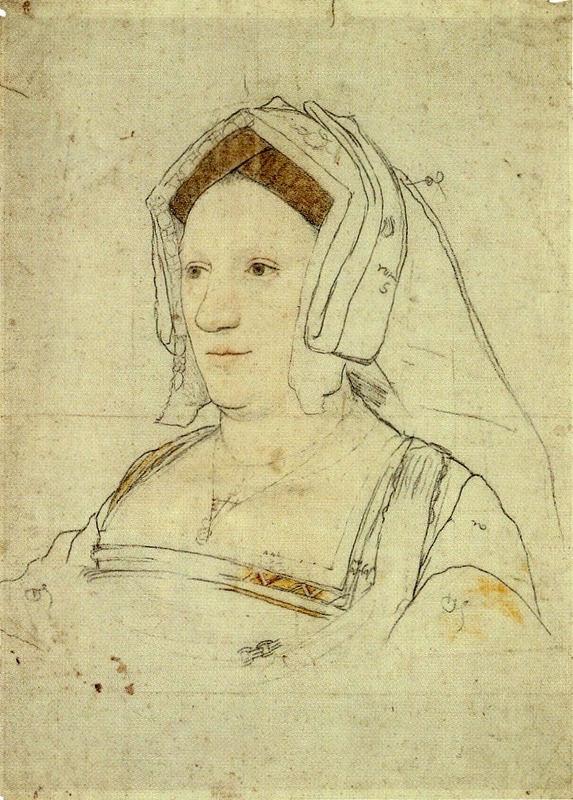 While Lüdin’s painting was given as a gift to a major art collector in Basel and probably based on a graphic model whose type proliferated after 1600, it is the drawing in the Uffizi (see Featured Image) that remains the only secure self-portrait image according to current Holbein scholarship. Hans Holbein the Younger was born in Augsburg, Germany, in 1497. After 1515, he lived and trained in Basel, Switzerland. Over two visits, one starting in 1526 and another in 1532, Holbein spent a total of thirteen years in Henry VIII’s England until the artist’s death in 1543. The focus for this post is Holbein’s first visit to England which lasted two years – specifically, from around September 1526 to mid-August 1528. His second, more permanent, visit to England started in 1532 (Holbein likely arrived in the spring) and lasting to his death, almost certainly from plague, in late 1543. It was during that second, longer visit in England that Holbein became the most important court artist in the time of Henry VIII. His first visit is characterized by the activity of a young immigrant German artist – Holbein was about 29 years in 1526 – getting established in a foreign land and developing a mastery of his craft. 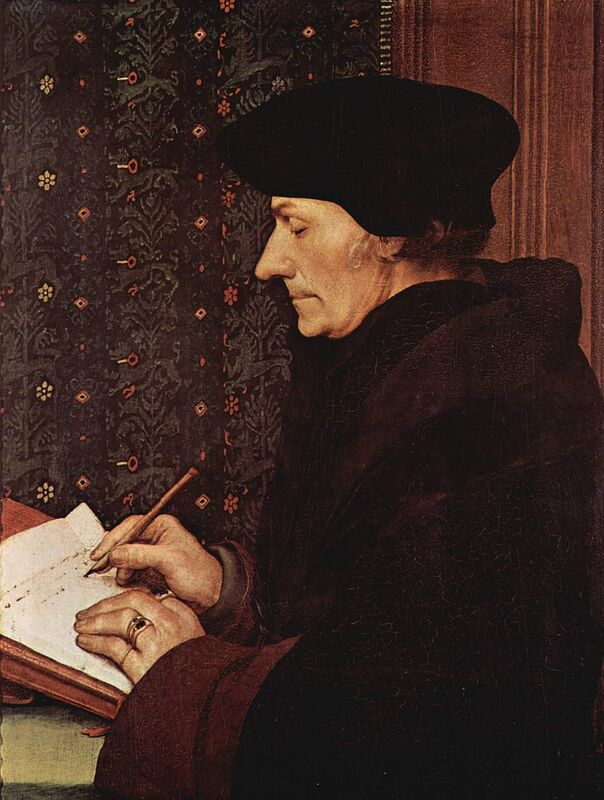 Historian David Starkey has called Holbein’s three-quarter profile portrait of Erasmus which was sent to the Archbishop of Canterbury William Warham (c.1450-1532) as a gift in 1524 as “the most important portrait in England”13 Starkey claims the painting is the beginning of portraiture itself when so-called “realism” was introduced into art. 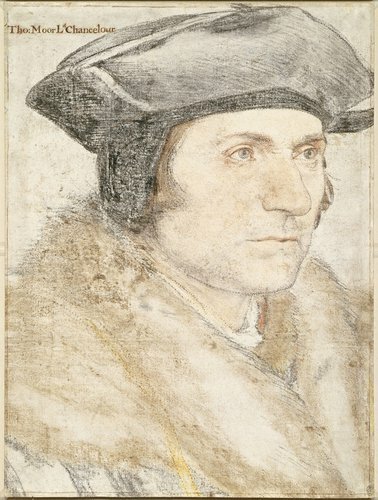 By way of Erasmus’s portrait to Warham, Thomas More learned of Holbein’s artwork up to two years prior to the young artist’s arrival in England. It is probable that like Erasmus before him, Holbein lodged in More’s house during his first English visit. Such accommodation provided practical hospitality to a friend’s friend on many levels including the fact that immigrant artists in England were disallowed from dwelling within the city gates of London (More’s house was in nearby Chelsea). Further, More, as a rising political figure in England, became Holbein’s first patron and in that way could secure Holbein’s modern art portraiture for himself. Indeed, the major work of Holbein’s first stay in England between 1526 and 1528 is the portrait of the household of Thomas More as well as the famous portrait of Sir Thomas painted around the same time. In this first two-year period in England Holbein also set to work on a variety of artistic projects, but the portraits highlighted the stay. 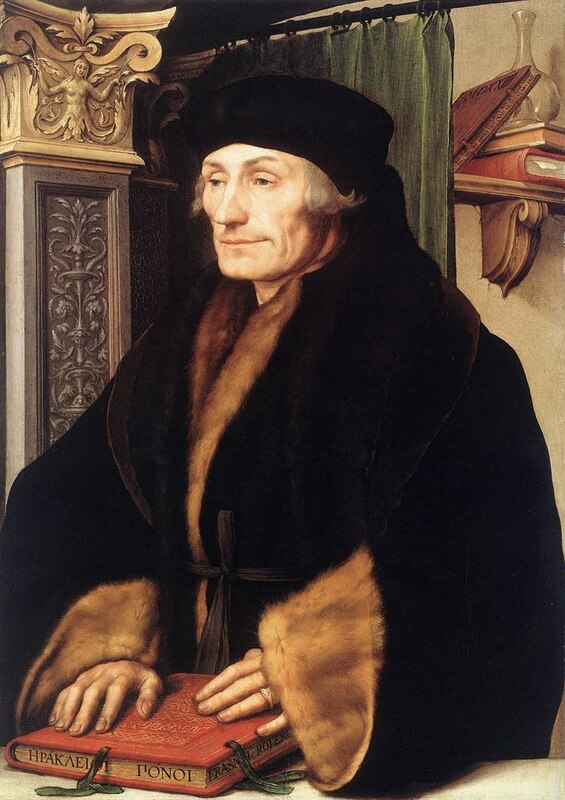 Hans Holbein the Younger: Portrait of Erasmus, 1523, oil on wood, 42 x 32 cm, Louvre, Paris. 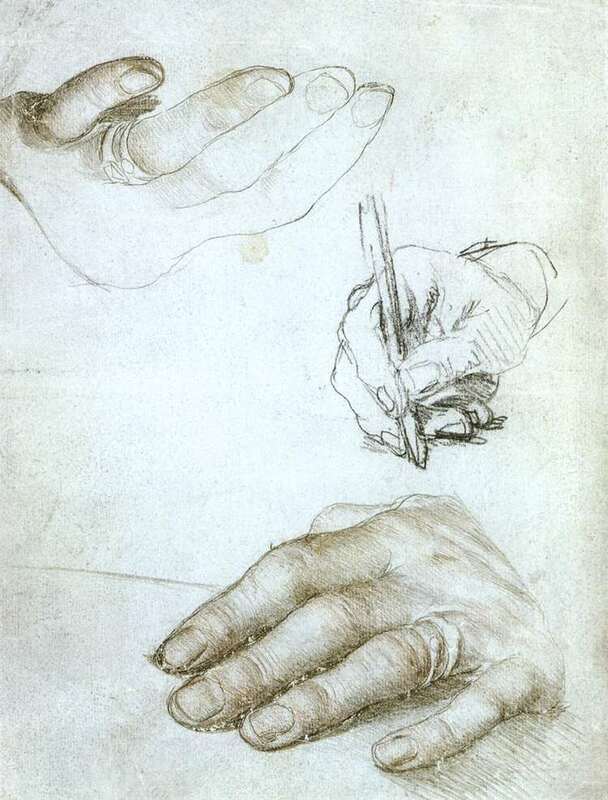 One of Holbein’s study drawings of Erasmus’s hands for the profile portraits, silverpoint and chalks, 1523. Louvre. Hans Holbein the Younger in England, 1526 to 1528. 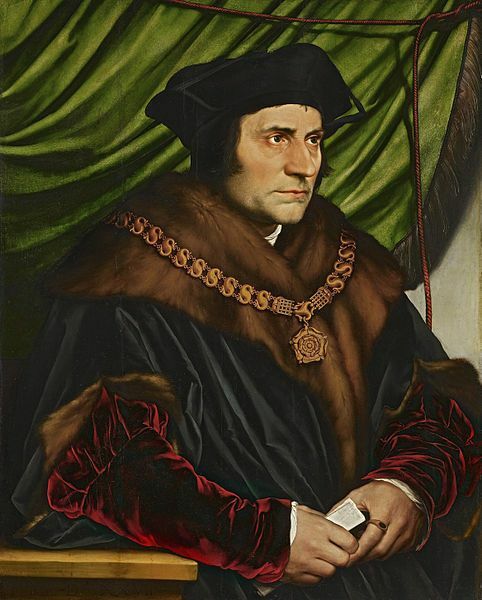 Hans Holbein the Younger: Thomas More (1477-1535), 1527, oil on oak panel, 29.5 in x 23.7 in. (74.9 cm x 60.3 cm), Frick Collection, New York. More became Lord Chancellor in 1529 where thereafter the great humanist scholar, author, and statesman, who resigned in 1532, defied the Act of Supremacy of 1534 that made Henry VIII head of the Church in England and was beheaded on July 6, 1535 for high treason. 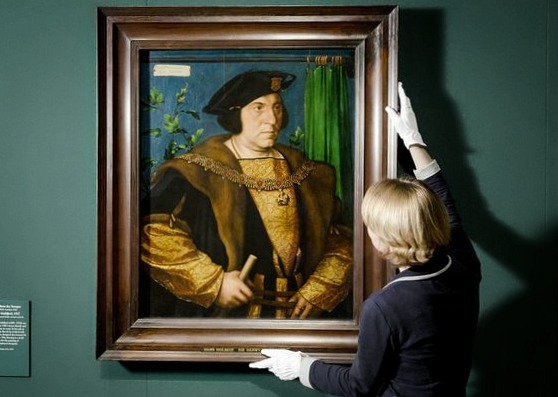 The “S-S” chain of office More wears in Holbein’s painting is an emblem of service to the King. (Frick, p. 48) More’s execution, coming in quick succession to John Fisher’s two weeks earlier, grieved Erasmus in Basel. 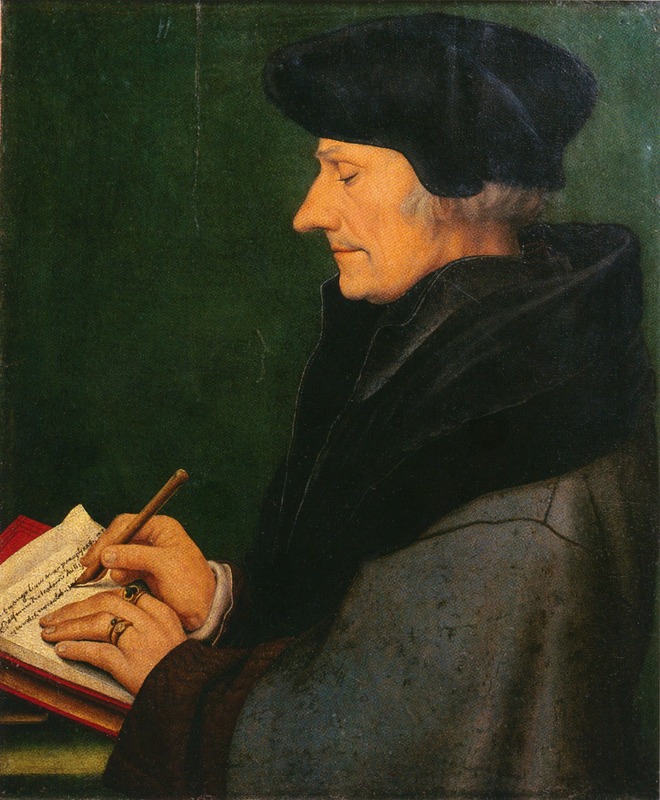 Later, Erasmus in a letter lamented More’s involvement in “that dangerous business” which should have been left to “the theologians,” and ignored More’s plea on behalf of his conscience. (Huizinga, p. 183). Hans Holbein the Younger: Thomas More, 1526/1527, black and colored chalks, 9.8 x 29.9 cm sheet of paper, outlines pricked for transfer. The inscription is a later addition (18th century). Royal Collection Windsor. 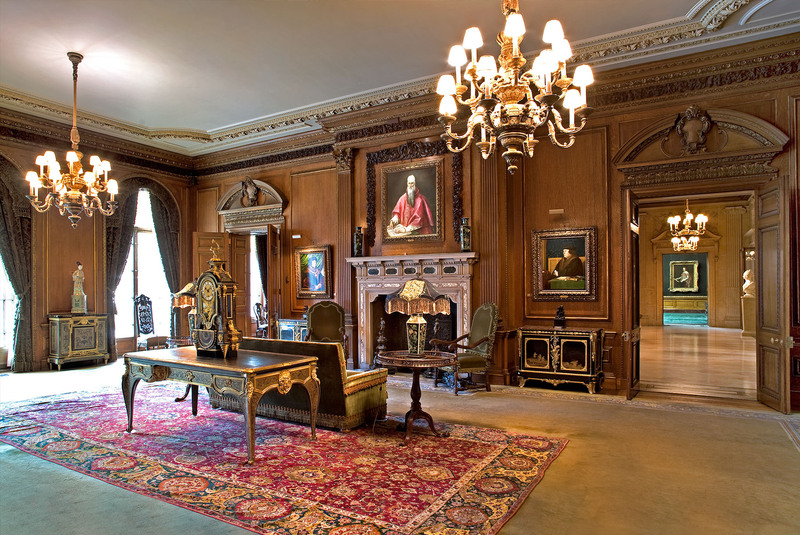 Frick Collection, New York City. Holbein the Younger’s Thomas More (1527) and Thomas Cromwell (1533) with El Greco’s Saint Jerome (1610) above the fireplace. 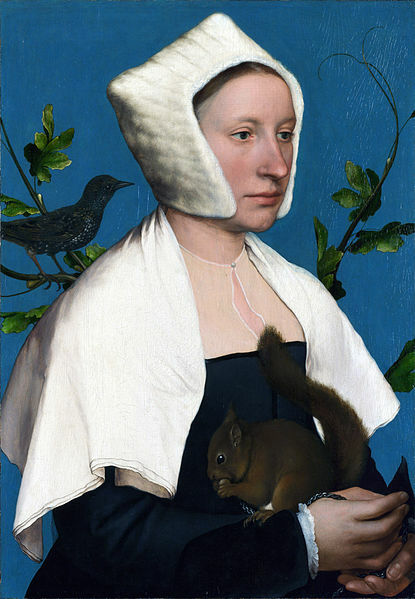 Hans Holbein the Younger: Portrait of a Lady with a Squirrel and a Starling (Anne Lovell), 1528, oil on oak, 56 x 38.8 cm, National Gallery, London. Recent scholarship has produced interesting speculations as to the identity of this unknown woman who, in any case, was in Thomas More’s circle (Foister, p. 30; Ganz, p. 232). Hans Holbein the Younger: Alice Middleton, Lady More, 1527, Corsham Court (private collection) near Bath, England, oil and tempera on oak, 14 1/2 x 10 5/8 in. This is a color study for the large family picture. The color chalk study is missing. Alice was Thomas More’s second wife. Hans Holbein the Younger: Portrait of Thomas More with his family, 1527, pen and black ink on paper, Öffentliche Kunstsammlung, Basel. 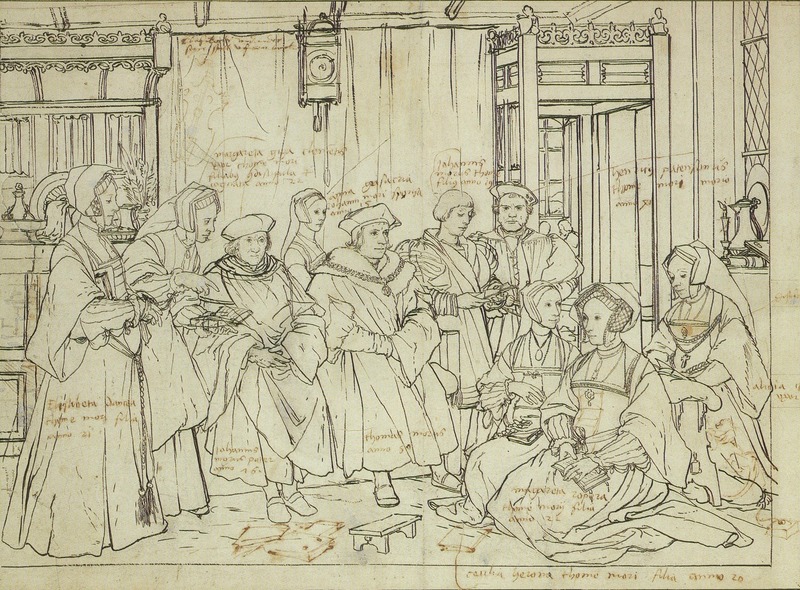 This is the preparatory drawing for a group portrait of the family of Sir Thomas More that was the major work of Holbein’s first period in England. The finished painting, whether on canvas or wood or a mural, is missing and was probably destroyed. It is the first nondevotional or ceremonial group portrait made north of the Alps (Ganz, p. 276). This is the household into which Holbein had taken up residence during his first visit to England. 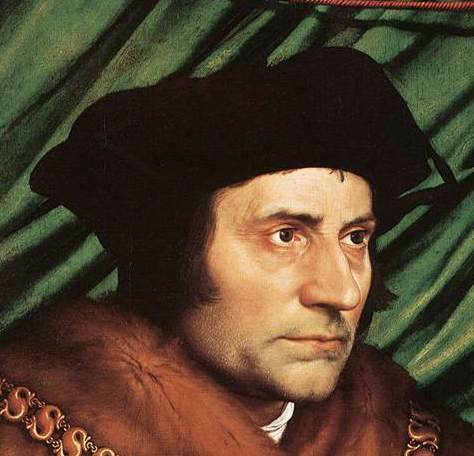 Thomas More lived outside London in a country house with his second wife Alice, his father John, his son John and bride to be Anne, three married daughters, eleven grandchildren and a live-in relative (Margaret Giggs). From left is Elizabeth Dauncy, More’s second daughter; Margaret Giggs; More’s father; Thomas More’s future daughter-in-law, Anne Cresacre; Sir Thomas More; More’s son; court entertainer Henry Patenson; More’s youngest daughter, Cecily Heron; eldest daughter, Margaret Roper; and More’s second wife, Alice. The Latin inscriptions in brown ink of the sitters’ names and ages were added a by astronomer-in-residence Nikolaus Kratzer (whose portrait was painted by Holbein). Margaret Giggs Clement was Thomas More’s foster daughter. In 1526 she married John Clement, a court physician. Margaret eventually had eleven children and died in exile in the Netherlands in 1570. 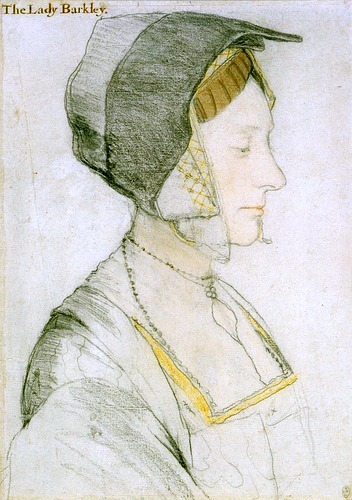 While the extant More family group drawing by Holbein shows Margaret leaning towards John More, this drawing may actually have served as the now-lost or destroyed painting’s final study. The exact meaning of the inscription “Mother Iak” is unknown. Royal Collection, Windsor. Hans Holbein the Younger: Anne Cresacre (c.1511-1577), for the More family portrait. Royal Collection, Windsor. Hans Holbein the Younger: Cecily Heron (b, 1506 or 1507), youngest daughter of Sir Thomas More. She was married to Giles Heron, a Member of Parliament who was hanged for treason in 1540. Royal Collection, Windsor. 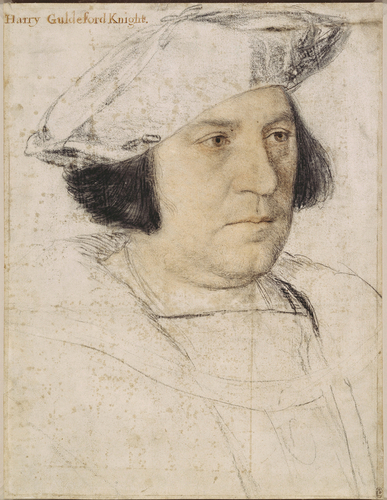 Hans Holbein the Younger: Sir John More (c.1451 – 1530), black and colored chalks, 35.1 x 27.3 cm. 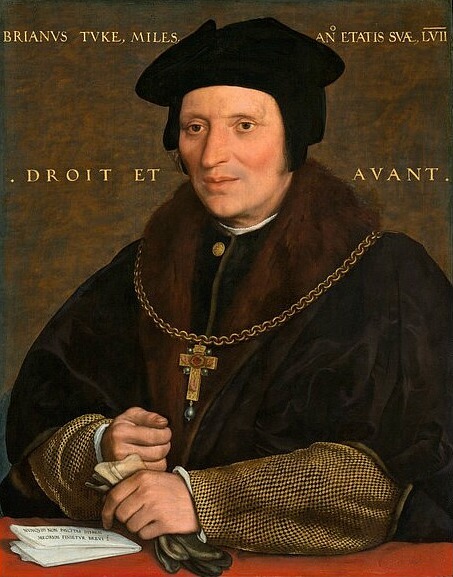 Thomas More’s father was a respected judge and described by a biographer as “very virtuous” and “merry.” Royal Collection, Windsor. 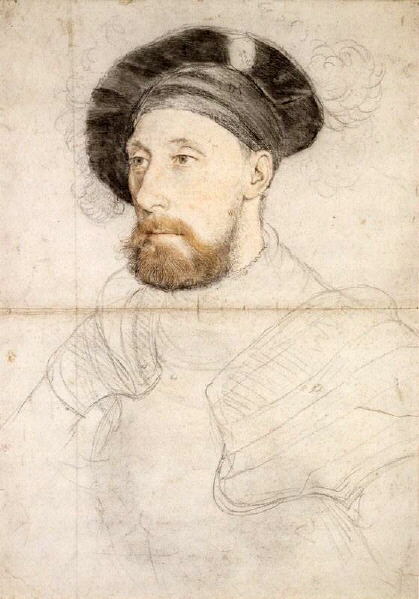 (Below) Hans Holbein the Younger: John More, black and colored chalks, 38.1 x 28.1 cm. Thomas More’s son. Royal Collection, Windsor. Hans Holbein the Younger: Sir Henry Guildford (1478-1532), Controller of the Royal Household, inscribed and dated, 1527, oil and tempera on wood, 32 1/8 x 26 in. (82.6 x 66.4 cm), Royal Collection, Windsor. 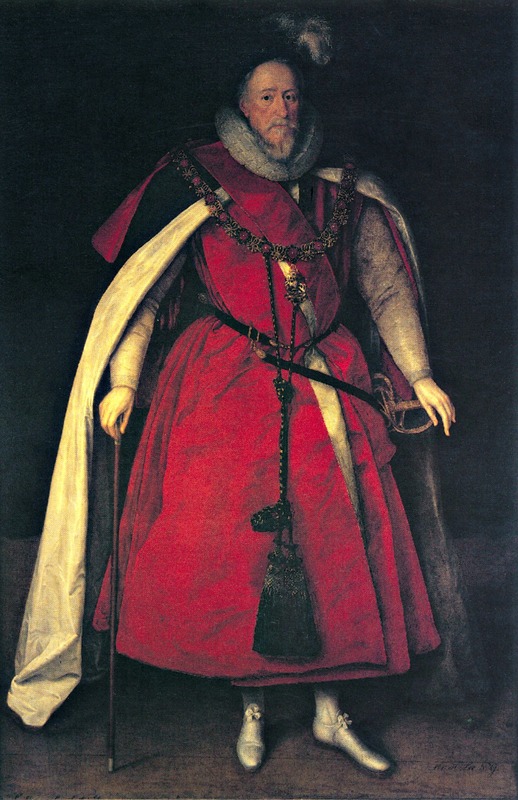 Wearing the collar of the garter for his military service – which was the occasion for the portrait – Guildford, a physical giant of a man, holds the wand of office as Comptroller of the King’s Household. Sir Henry stands against a deep blue background, decorated with the twisting vine found in several Holbein portraits. Above the sitter’s head is a curtain rail, from which hangs a rich green curtain. This detail has lost context in the separation of the portrait from its companion, that of Guildford’s wife Mary. Sir Henry Guildford, Black and colored chalks, and pen and ink on paper, 38.3 x 29.4 cm. The drawing is a study for the painted portrait. 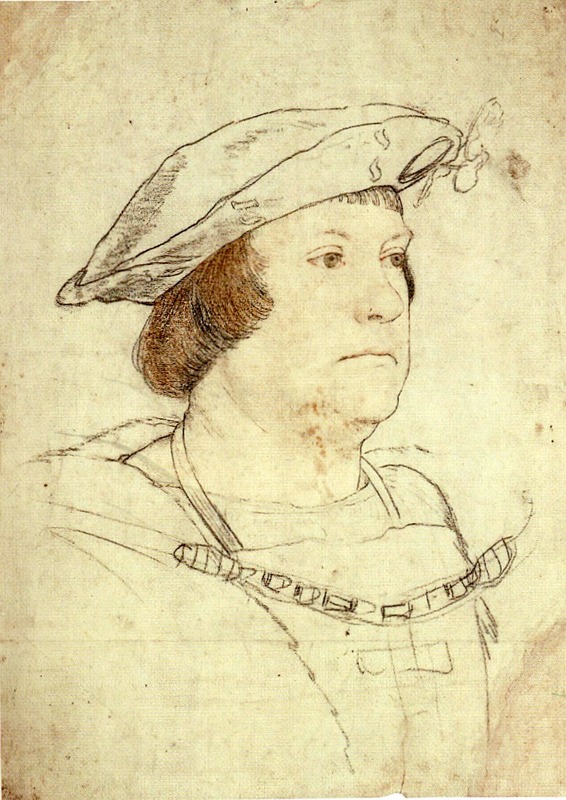 Sir Henry was one of Henry VIII’s closest friends and an early patron of Holbein. 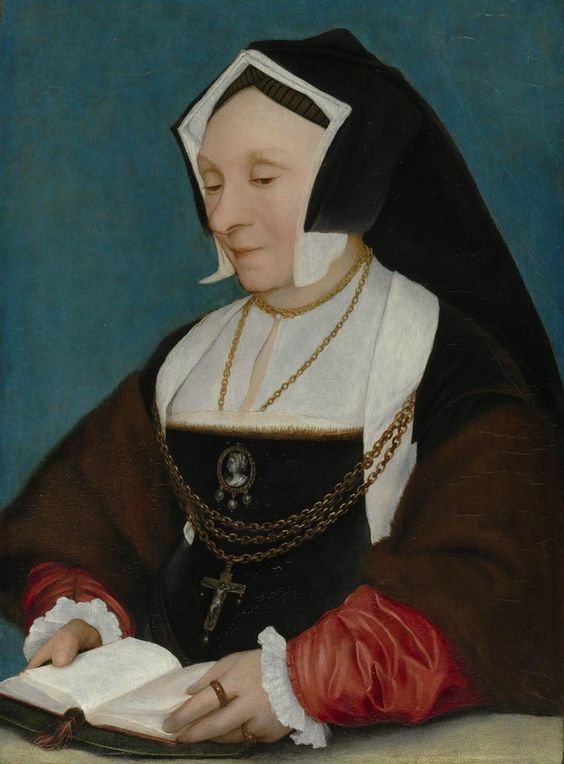 Hans Holbein the Younger: Mary Wotton, Lady Guildford, inscribed and dated, 1527, tempera and oil on oak, 34 1/4 x 27 13/16 in. ( 87 × 70.6 cm), St. Louis Art Museum. Mary was Sir Henry Guildford’s second wife. They married in 1525. She holds a devotional book. 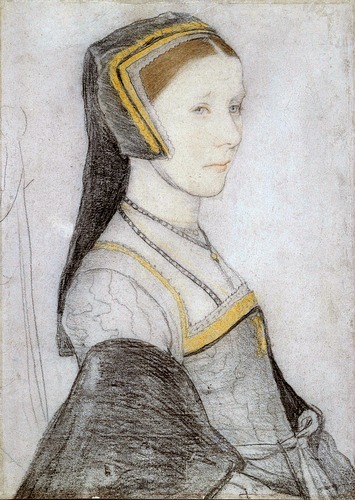 Mary Wotton, Lady Guildford, 1527, black and colored chalk on paper, 55.2 x 38.5 cm, Kunstmuseum Basel, Kupferstichkabinett. A study from life for the painted portrait. In the portrait Holbein muted the sitter’s overall playful expression and smile. Mary outlived Sir Henry to marry again. Hans Holbein the Younger: William Warham (1456-1532), Archbishop of Canterbury (first version), 1527, Oil and tempera on wood, 30 in x 25.75 in., Lambeth Palace, London. 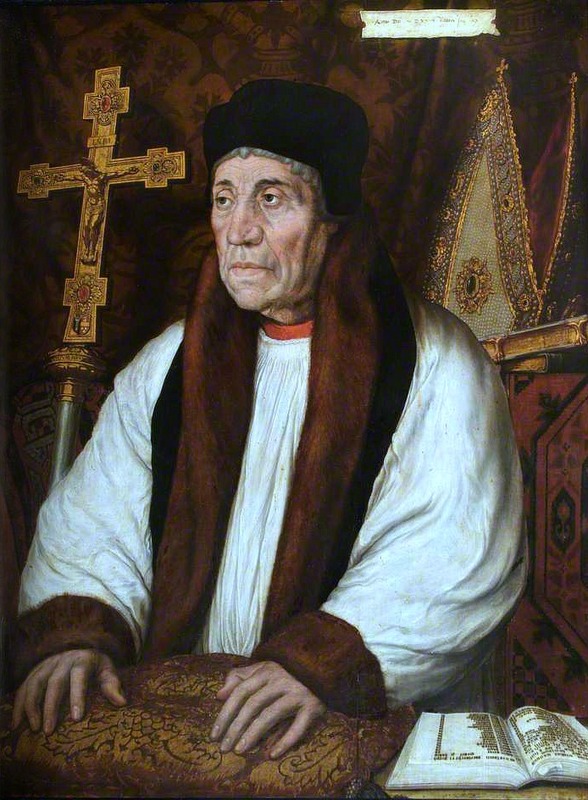 Hans Holbein the Younger: William Warham, Archbishop of Canterbury (second version), 1527, Tempera on wood, 32.3 in x 26.4 in. (82 cm x 67 cm), Musée du Louvre, Paris. Both versions include the episcopal crucifix of gold and jewels with Warham’s coat-of-arms and his motto, prayer books and the Archbishop’s jeweled miter. 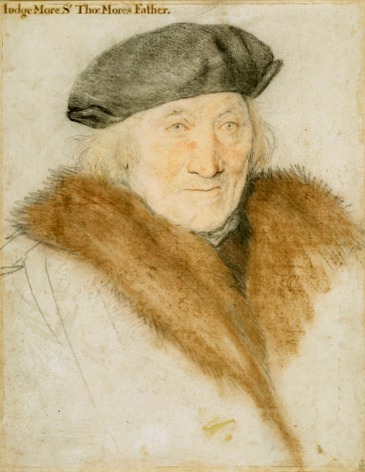 Warham had this “original replica” painted to reciprocate for a portrait of Erasmus he received. The color is richer in the replica. The brown curtain is replaced with a green one. A later copy of this painting resides in the National Portrait Gallery in London. Hans Holbein the Younger: William Warham, Archbishop of Canterbury, 1527. Colored chalk on paper, 40.1 x 31 cm, The Royal Collection, Windsor. This is the preparatory drawing for the Louvre portrait. The sitter had been in his position since 1504 and remained there until his death in 1532. The similarities between the Holbein portrait of Erasmus (1523) and that of Warham (1527) are striking for their compositional elements and the conveyance of each sitter’s function by way of iconographical symbols so that these forms are a portrait template. 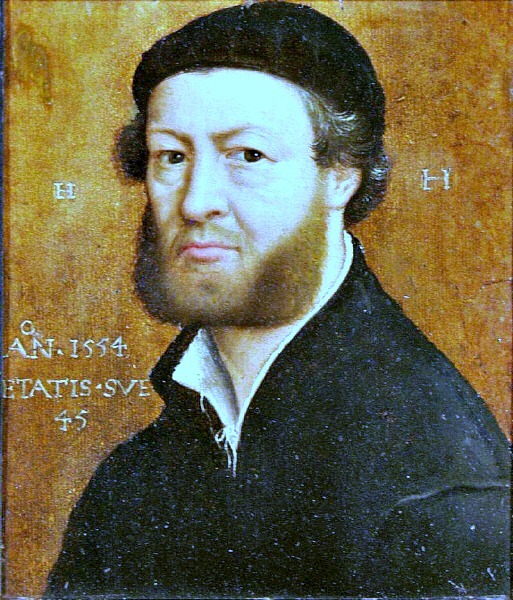 Hans Holbein the Younger: Portrait of Nikolaus Kratzer (1487-1550), 1528, Tempera on oak, 83 x 67 cm, Musée du Louvre, Paris. The sitter was born in Munich and studied in Cologne and Wittenberg. With an appointment as professor to Corpus Christi College in Oxford, Kratzer relocated to England. As a humanist, he became friends with Thomas More and his family and, starting in 1519, served as an astronomer to Henry VIII’s court. 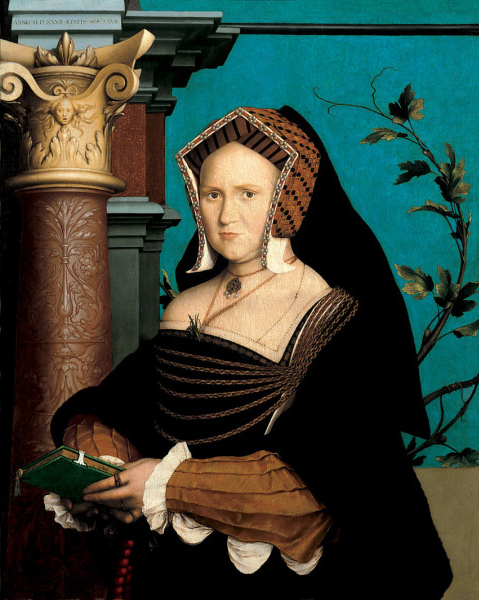 The painting, created during Holbein’s first stay in England, continues to exemplify Holbein’s lively style of illustrating a sitter’s career. Kratzer was a maker of mathematical and geometrical instruments and is shown in practical involvement with these tools. Compared with the Guildford portraits of the year before, Holbein expresses a new subtlety of lighting and refined range of tones. 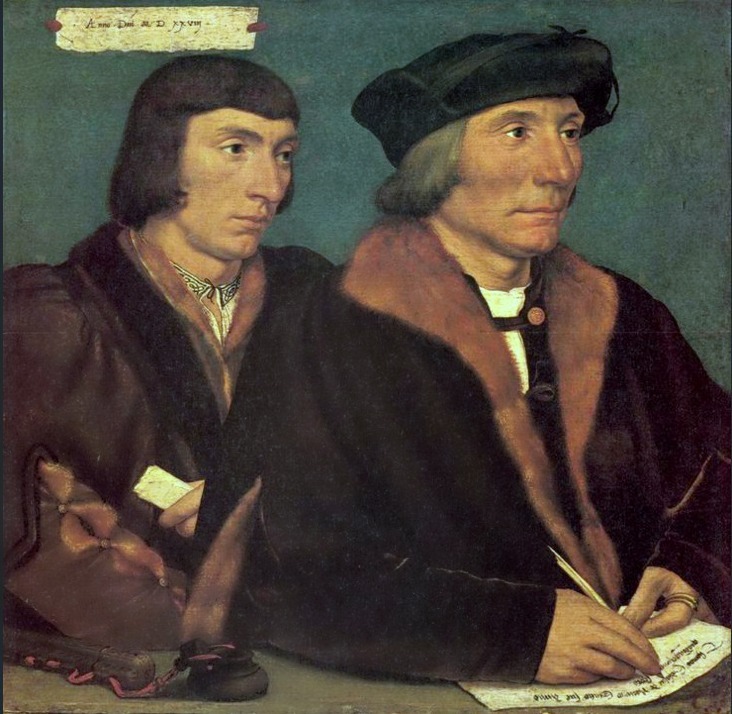 Hans Holbein the Younger: Double Portrait of Sir Thomas Godsalve and His Son John, 1528, Resin tempera on oak, 35 x 36 cm, Gemäldegalerie, Dresden. Thomas Godsalve (1481-1542) was a notary from Norfolk. Holbein cleverly shows him writing his name and age on a sheet of paper. By 1528, the Godsalves were among London’s most wealthy and politically influential men. (Wolf, p. 51) His son John (1510-1556) later had a double portrait of himself and his wife painted by Holbein. Hans Holbein the Younger: Sir Henry Wyatt of Allington Castle, c. 1528?, oil on oak, 15.4 × 12.2 in. (39 × 31 cm), Musée du Louvre, Paris. Sir Henry Wyatt served in the court of Henry VII and Henry VIII and a member of the latter’s Privy Council. Sir Henry was part of the circle of Thomas More. N.B. 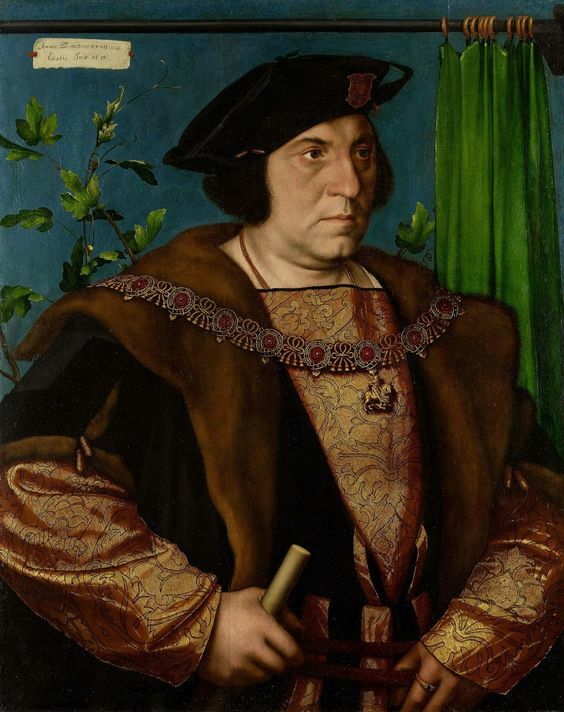 This portrait, once thought to have been painted during Holbein’s first visit to England from 1526 to 1528, is today believed to have been painted towards the end of Sir Henry’s life. Hans Holbein the Younger: Sir Bryan Tuke, c. 1527/1528 or c. 1532/1534, oil on wood, 49 x 39 cm, National Gallery of Art, Washington, D.C. The sitter is about 57 years old. The date of the painting is unknown and its conjecture is based on its style although that leads to at least two possibilities. 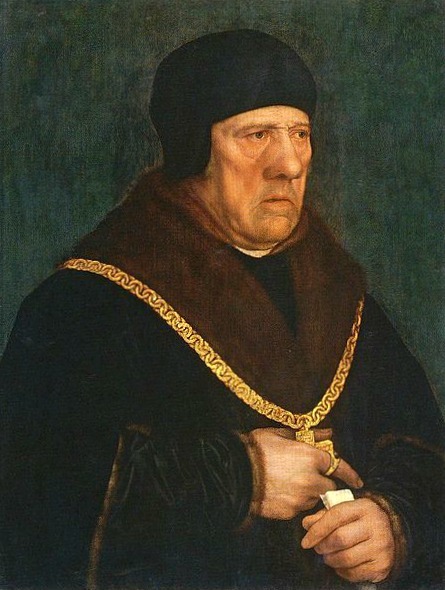 The physical mass of the body and the sitter’s expression suggest Holbein’s last year in England (mid 1528) although the painting’s other features (notably its horizontal lines of text) suggest the painting was made after Holbein’s return to London in 1532. There are further later additions after that. The subject, Bryan Tuke (1470-1545), was, starting in 1509, Clerk of the Signet and then Cardinal Wolsey’s secretary. By 1528 Sir Bryan was Treasurer of the Royal Household and secretary to the king for French affairs, a post he held until his death in 1545. There exist several versions of this portrait. 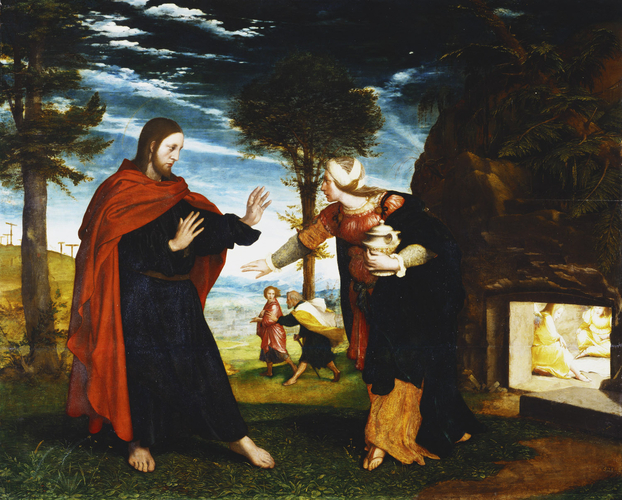 Hans Holbein the Younger: Noli Me Tangere, 1526-1528?, Oil on oak panel, 76.7 x 95.8 cm, Royal Collection Windsor. Holbein paints the gospel narrative of Mary Magdalen meeting Jesus Christ at his resurrection, with angels illuminating the tomb and night breaking for dawn. Between the major figures, a rushing Peter and John in the background are discussing matters. Royal Collection, Windsor. 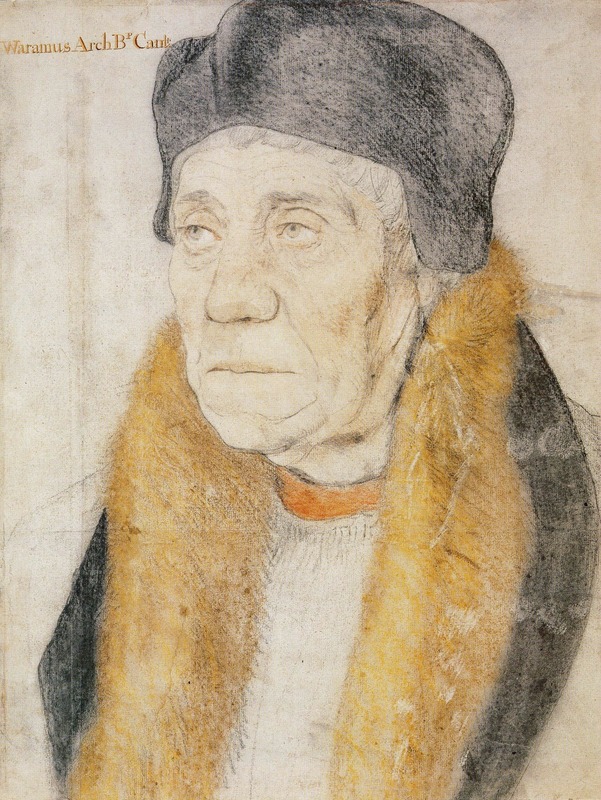 Hans Holbein the Younger: Sir Nicholas Carew, 1527, black and colored chalk sheet: 54.8 x 38.5 cm, Kunstmuseum Basel, Kupferstichkabinett, Amerbach-Cabinet. Sir Nicholas was Henry VIII’s Master of the Horse until he was implicated in one of the various popular uprisings against the same king’s religious policies in the mid-1530’s, and summarily executed in 1539. 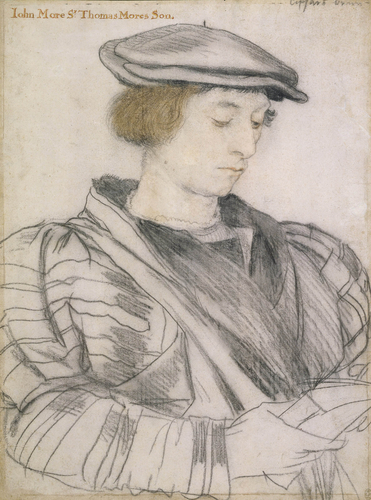 (Foister, p.121) Hans Holbein the Younger: Portrait of an Unknown Englishman, 1527, black and colored chalk and leadpoint on prepared paper; outlines traced blind, 38.9 x 27.7 cm, Kunstmuseum Basel, Kupferstichkabinett. 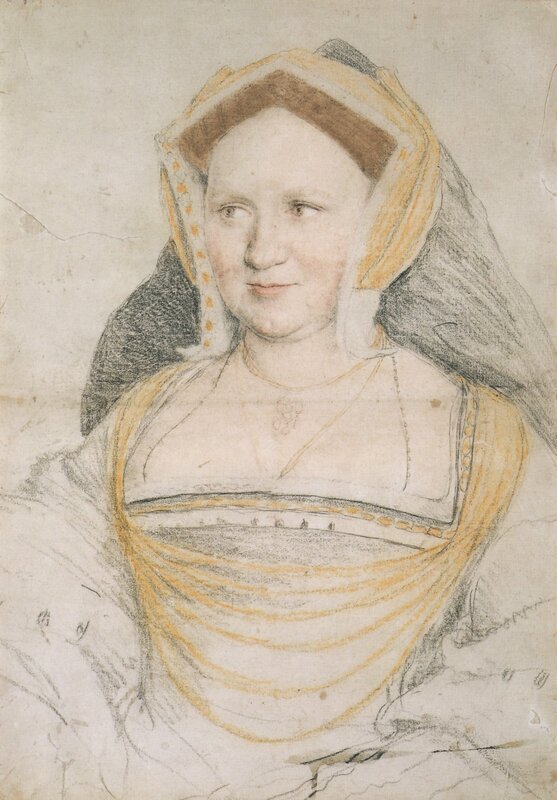 Hans Holbein the Younger: Portrait of an Unknown Englishwoman, 1527, black and colored chalk and leadpoint on prepared paper; outlines traced blind, 38.9 x 27.7 cm, Kunstmuseum Basel, Kupferstichkabinett. These two drawings were prepared for transfer to panels for painting portraits, neither of which survive. Erasmus and the Age of Reformation, Johan Huizinga, Harper & Brothers, New York, reprint 1957, p. 223. 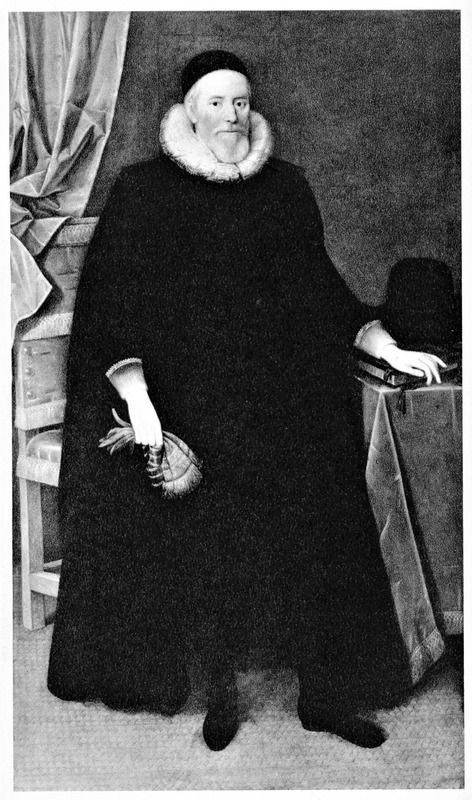 Hans Holbein The Younger: The German Raphael, Norbert Wolf, Taschen, Cologne, Germany, 2006, p. 28. 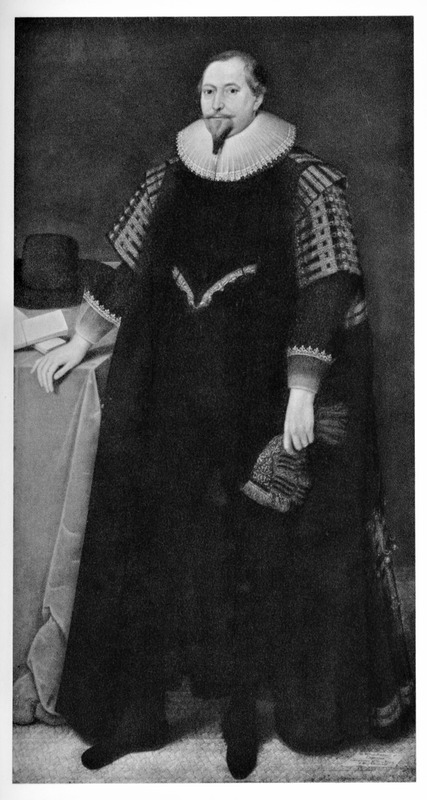 Holbein in England, Susan Foister, Tate Publishing, London, 2006, p. 13. An Advanced History of Great Britain: From the Earliest Times To the Death of Edward VII, T.F. Tout, M.A., Longmans, Green, and Co, New York, London, Bombay and Calcutta, 1913, p.342. An Advanced History of Great Britain: From the Earliest Times To the Death of Edward VII, T.F. Tout, M.A., Longmans, Green, and Co, New York, London, Bombay and Calcutta, 1913. Erasmus and the Age of Reformation, Johan Huizinga, Harper & Brothers, New York, reprint 1957. Five centuries of British painting: from Holbein to Hodgkin, Andrew Wilton, London: Thames & Hudson, 2001. 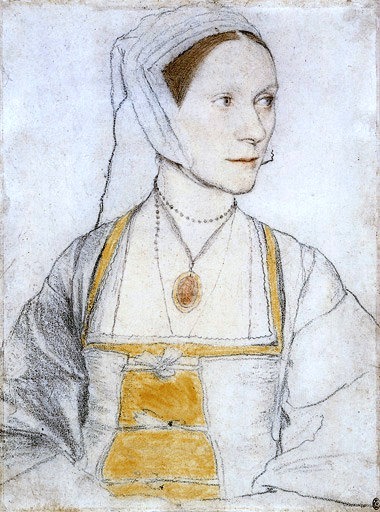 Holbein in England, Susan Foister, Tate Publishing, London, 2006. Hans Holbein The Younger: The German Raphael, Norbert Wolf, Taschen, Cologne, Germany, 2006. The Frick Collection /A Tour, Edgar Munhall, et.al, The Frick Collection, New York, 1999. The Paintings of Hans Holbein: First Complete Edition, Paul Ganz, Phaidon, London, 1950. 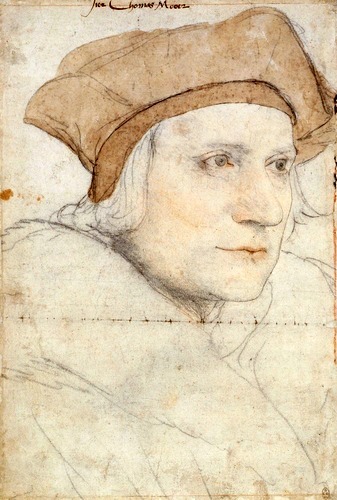 Hans Holbein the Younger: ‘A man very excellent in taking of physionamies’ (sic) – Dr Susan Foister – https://www.youtube.com/watch?v=3UnbWlZnYv4 – retrieved February 26, 2018.
http://sammlungonline.kunstmuseumbasel.ch/eMuseumPlus – retrieved February 26, 2018. This entry was posted in Art, ARTIST, British art, Hans Holbien the Younger, Portraits and tagged Anne Cresacre, Cecily Heron, Desiderius Erasmus, Elizabeth Dauncey, Hans Holbein the Younger, King Henry VIII of England, Nikolaus Kratzer, Sir Bryan Tuke, Sir Henry Guildford, Sir Henry Wyatt, Sir Nicholas Carew, Sir Thomas Godsalve, Sir Thomas More, Thomas Cromwell, William Warham on March 1, 2018 by jwalsh2013. Marcus Gheeraerts the Younger: a complete collection of his signed, dated, documented and inscribed works, featuring Captain Thomas Lee in Irish Dress, oil on canvas, 1594, in Tate Britain. (33 paintings). Text and captions by John P. Walsh. Captain Thomas Lee (c.1551-1601) had his portrait painted by 33-year-old Marcus Gheeraerts the Younger (Bruges, 1561-1636) in London in 1594. Captain Lee was 43 years old and had worked as a military adventurer for English colonization in Ireland since the early 1570s. The young artist was the son of Gheeraerts the Elder, a painter and printmaker associated with the Tudor court starting in the late 1560s and into the 1570s. Fleeing religious persecution in Flanders, Gheeraerts the Elder (c. 1520 – c. 1590) arrived into England with his 7-year-old son Marcus in 1568. By 1594, when the portrait of Captain Lee was made, Gheeraerts the Younger was already a rising young contemporary artist working in Elizabeth I’s Tudor court (Gheeraerts the Elder had likely returned to Flanders in 1577). Sir Roy Strong, the English art historian who served as director of both the National Portrait Gallery and the Victoria and Albert Museum in London is unequivocal about Gheeraerts the Younger’s artistic importance to English art history when he wrote that Gheeraerts is “the most important artist of quality to work in England in large-scale between (Hans) Eworth (c. 1520 – 1574) and (Anthony) van Dyck (1599-1641).”1 In addition to a discussion of the featured early painting of Captain Lee, a complete collection of Marcus Gheeraerts the Younger’s 33 signed and dated works, documented and dated works, inscribed and dated works, and inscribed and undated works is included in this post following this introduction. At 22 years old in 1583, Marcus Gheeraerts the Younger’s world in and around London was ideally enclosed by marriage to the sister of talented Tudor court painter John De Critz (c.1555-c.1641). De Critz, like his new brother-in-law Gheeraerts the Younger, was a child expatriate from Flanders to England in 1568.2 In 1571 Gheeraerts the Elder had married his son’s future wife’s sister, making father and son Gheeraerts also eventually brothers-in law.3 Over two decades later, in 1602, Gheeraerts the Younger’s sister married the court artist Isaac Oliver (c.1565-1617).4 This was typical social behavior at the Tudor court where many active artists were connected by ties of marriage, family, and artistic training as well as shared European origin. In Gheeraerts the Younger’s circle, for instance, John De Critz was apprenticed to the wealthy portrait painter Lucas de Heere (1534-1584) who may also have helped train Gheeraerts the Younger. De Heere – like Gheeraerts the Younger and De Critz – was a religious refugee to England from Flanders. Isaac Oliver, Gheeraerts the Younger’s other brother-in-law, studied under leading Tudor portrait miniaturist and goldsmith Nicholas Hilliard (c.1547-1619) 5 Roy Strong links Hilliard to Gheeraerts by way of the supreme artistic quality found in both of these contrasting artists’ masterpieces.6 One remarkable technical innovation that the young artist applied in his portraits was the use of stretched canvas in place of wood panel that allowed for larger and lighter surface areas on which to paint and more easily transport pictures of the grand gentlemen and ladies of the time. 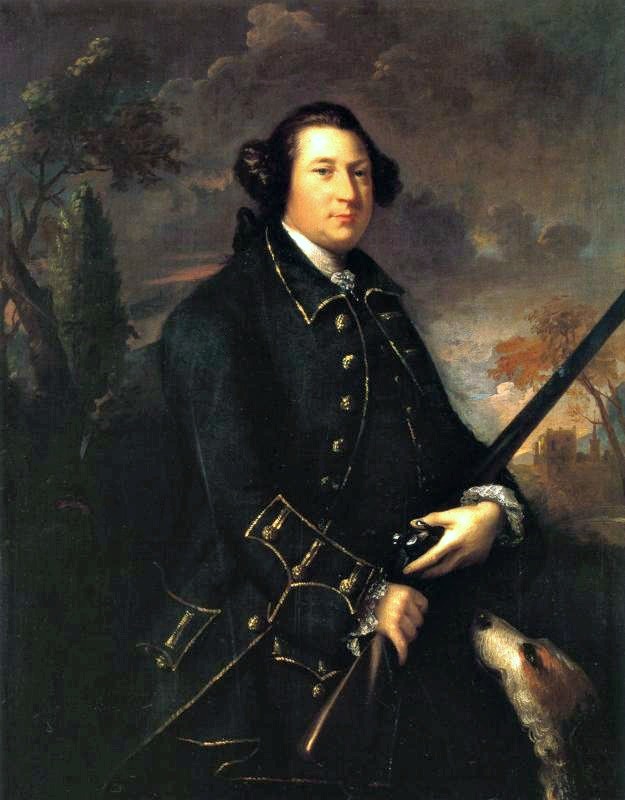 By way of marriage to an Irish Catholic woman, Captain Thomas Lee became a man of considerable property in Ireland but had separated from his wife by the time of this portrait. The next year – in 1595 – Lee remarried an Englishwoman. Over the decades, Captain Lee’s military reputation became one of an enfant terrible which did not mellow over time. Rather it would be powerful friends who looked to explain Thomas’s frequent reckless political and military behavior as a justifiable occupational hazard of the longtime soldier in Ireland. 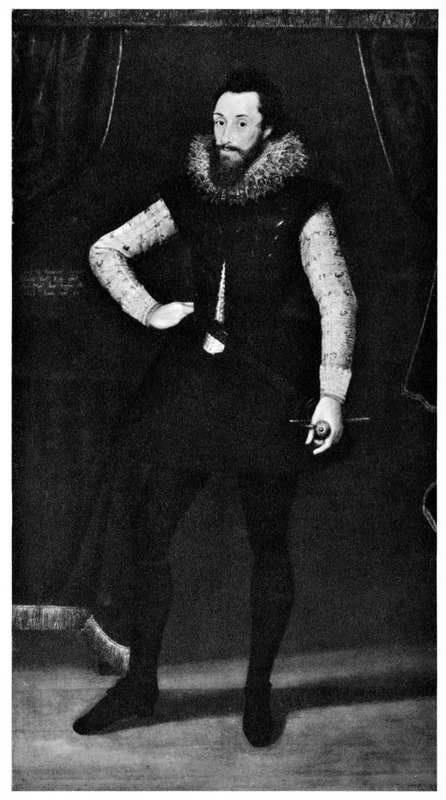 Lee posed for Gheeraerts when the captain was straight off the battlefield from Ulster chieftain Aodh Mag Uidhir (Hugh Maguire, d. 1600) and in London for delicate negotiations. To presumably express Thomas’s faithful service to the Crown, the portrait includes a Latin inscription in the tree that refers to Mucius Scaevola (c. 500 BC), an ancient perhaps mythical Roman fighter who remained loyal to Rome even after he was captured by mortal enemies. 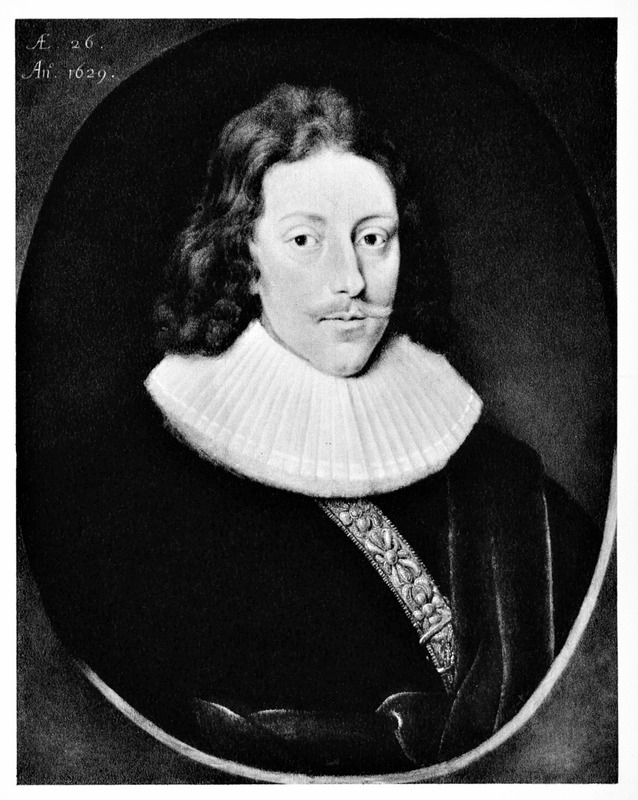 Thomas was related to Sir Henry Lee – they were paternal half cousins. 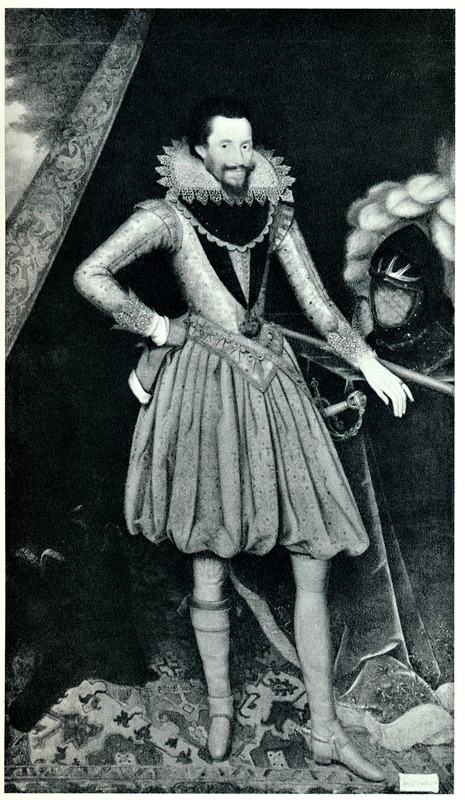 Sir Henry up until his recent retirement in 1590 (though still active and influential in political affairs) was Elizabeth I’s Champion for nearly a quarter of a century and the creator of the stunning imagery included in her publicly-popular Accession Day festivals that Sir Henry annually planned. 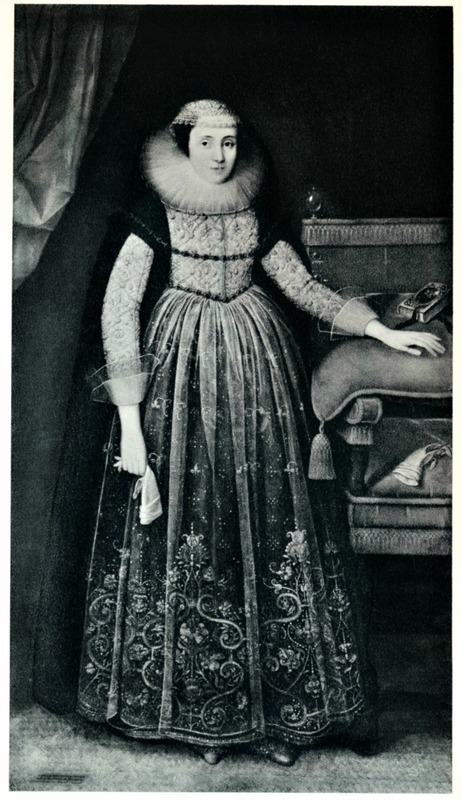 Along with Gheerearts the Younger’s Elizabethan allegorical portrait Lady in Fancy Dress (The Persian Lady) (#30 below) as well as the Ditchley portrait of Queen Elizabeth I (#31 below), both painted in the early 1590s, Henry may have helped devise the symbolism in Captain Lee’s portrait which also came from Ditchley – Sir Henry Lee’s timber-framed family house set in north Oxfordshire wooded farmland– around that same time. While the painting’s landscape where Captain Lee stands is likely a representation of Ireland’s wild landscape, Henry Lee’s symbolism may provide other more subtle and humorous features. Troublesome Thomas, for example, stands under an oak, which may refer to Sir Henry’s political protection but also that these trees are prone to dangerous lightning strikes. The final seven years of Captain Thomas Lee’s life iterated this legendary standard: at times negotiating with or killing Irish enemies he also served time in prison in Ireland on a charge of treason. 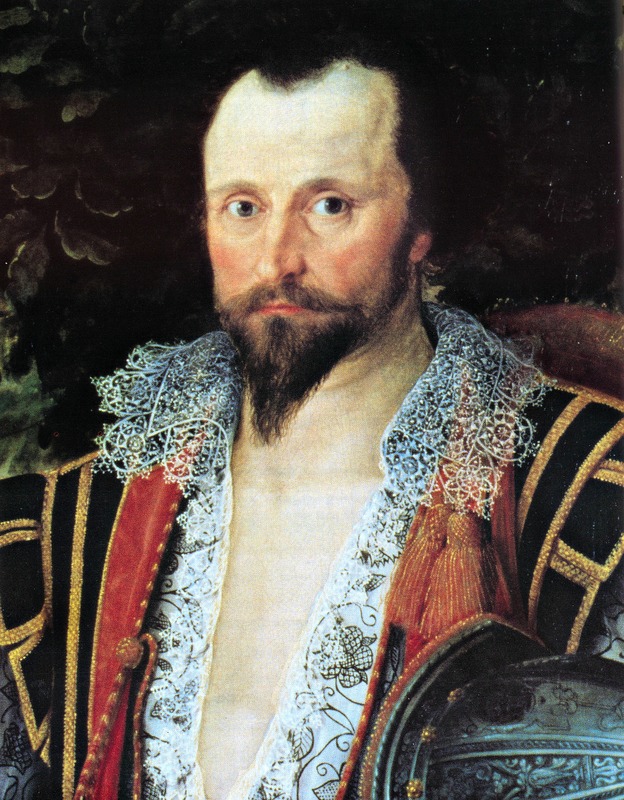 Ultimately, Sir Henry could not save his familial junior – Thomas faced execution in England for treason against Elizabeth I in 1601. 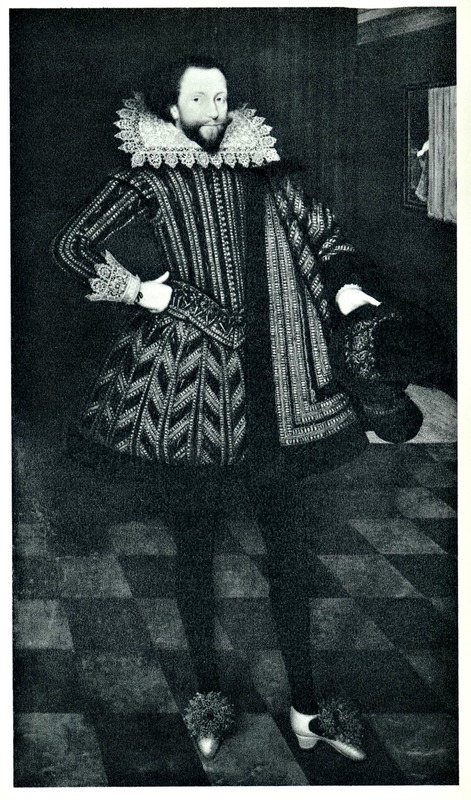 Strong, Roy, The English Icon: Elizabethan & Jacobean Portraiture, The Paul Mellon Foundation for British Art London Routledge and Kegan Paul Limited New Haven Yale University Press, 1969, p.22. Hearn, Karen, Marcus Gheeraerts II: Elizabethan Artist, In Focus (Tate Publishing), 2003, p. 11ff. See Roger Chauviré, A Short History of Ireland, New American Library, 1965; T.W. Moody & F.X. Martin, editors, The Course of Irish History, Mercier Press, Cork, 1978; http://www.tate.org.uk/art/artworks/gheeraerts-portrait-of-captain-thomas-lee-t03028 – retrieved May 28, 2017. The Captain Thomas Lee portrait was first recorded at Ditchley by Vertue in 1725 who noted there a portrait of ‘Lee in Highlanders Habit leggs naked a target & head piece on his left hand his right a spear or pike. Ætatis suae.43.ano.Dni 1594’. 1. Marcus Gheeraerts The Younger, Louis Frederick, Duke of Württemberg, 1608, oil on canvas, 225.1 x 113.1 cm, St James Palace. Probably painted for James I though first recorded in Charles II’s collection. (Strong 255, The English Icon). Gheeraerts II painted portraits of several foreign dignitaries on their visits to the English court. Louis Frederick, Duke of Württemberg visited James I in London for three months in the latter part of 1608 and likely the artist produced this work at that time. 2. Marcus Gheeraerts the Younger, William Camden, 1609, oil of panel,, 76.2.x 58.5 cm, Bodleian Library, Oxford. Given to the Schools by Camden Professor (1622-1647) Degory Whear. (Strong 256). 3. 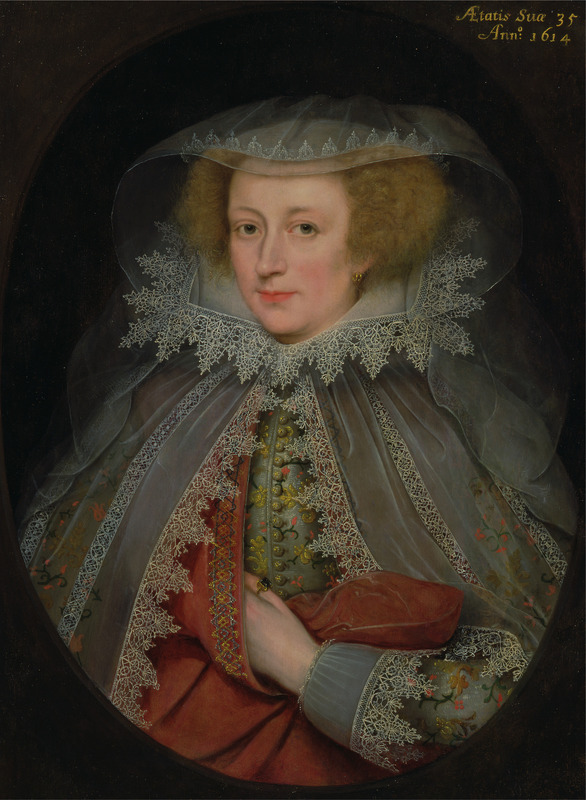 Marcus Gheeraerts the Younger, Lucy Davis, Countess of Huntingdon, 1623, oil on panel, 76.8 x 62.3 cm, Private Collection. (Strong 257). 4. 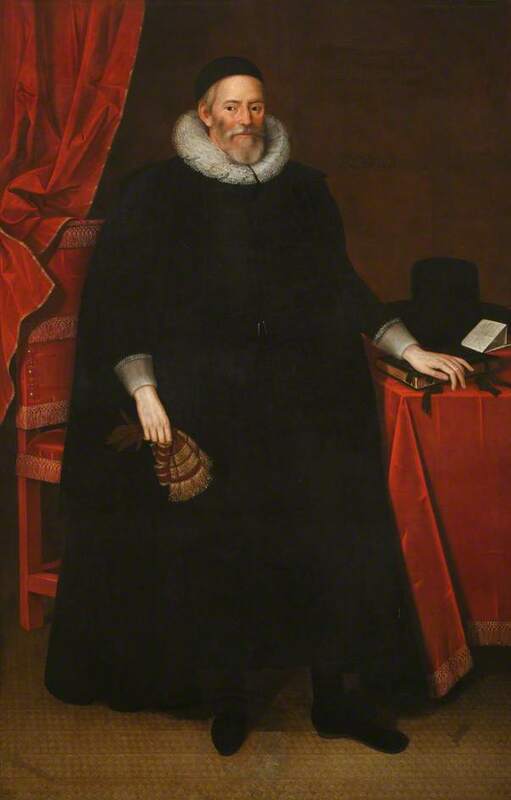 Marcus Gheeraerts the Younger, William Pope, 1st Earl of Downe, 1624, oil on panel, 62.3.x 47.1 cm, Trinity College, University of Oxford. It was presented to Trinity College in 1813 by Henry Kett. (Strong 258). 5. 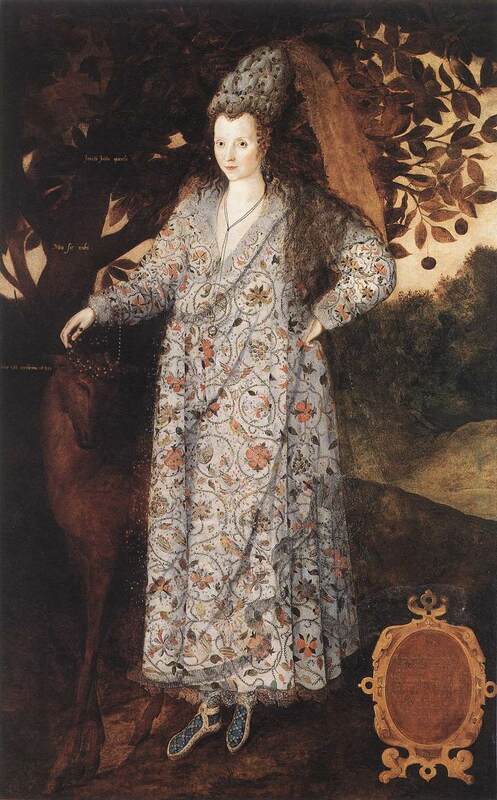 Marcus Gheeraerts the Younger, Elizabeth Cherry, Lady Russell, 1625, oil on canvas, 194.5 x 105.6 cm, The Duke of Bedford. This painting has been at Woburn Abbey since 1625. (Strong 259). 6. Marcus Gheeraerts the Younger, Sir William Russell, 1625, oil on canvas, 195.6 x 111.8 cm, The Duke of Bedford. Always at Woburn Abbey. (Strong 260). 7. Marcus Gheeraerts the Younger, Richard Tomlins, 1628, oil on panel, 111.8 x 83.9 cm. The Bodleian Library, Oxford. It was in the Library in 1759. (Strong 261). 8. Marcus Gheeraerts the Younger, Anne Hale, Mrs. Hoskins, 1629, oil on panel, 111.8 x 82.7 cm. Jack Hoskins Master, Esq. The painting remains in the family. (Strong 262). 9. 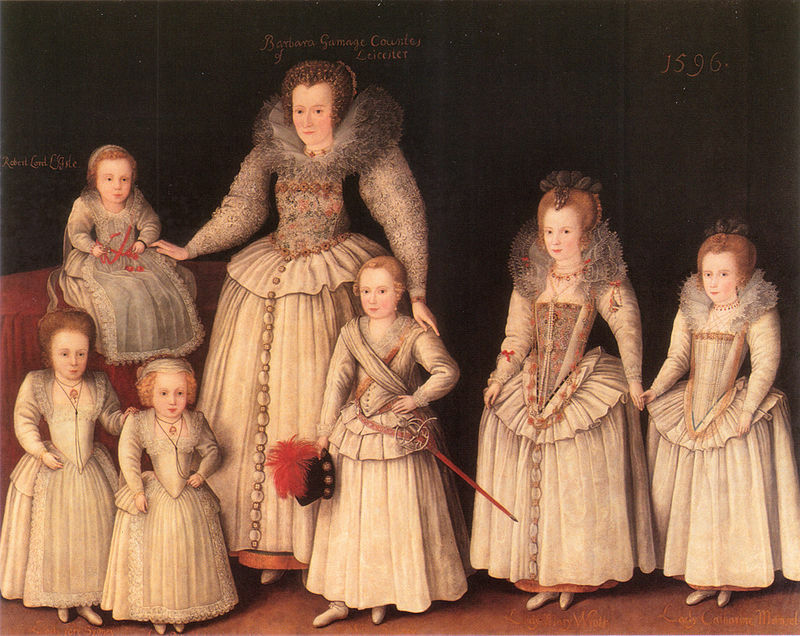 Marcus Gheeraerts the Younger, Barbara Gamage, Countess of Leicester, and her children, 1596, oil on canvas, 203.2 x 260.3 cm, The Viscount De L’Isle. Always at Penshurst Place near Tonbridge, Kent, 32 miles southeast of London; first recorded 1623. (Strong 263). 10. Marcus Gheeraerts the Younger, William, 2nd Lord Petre, 1599, oil on panel. 111.8 x 90.2.cm. The Lord Petre; custody of the Essex County Record Office. (Strong 264). 11. Marcus Gheeraerts the Younger, Katherine Somerset, Lady Petre, 1599, oil on panel, 111.8 x 90.2 cm. The Lord Petre. Always at Ingatestone Hall, the 16th century manor of the Barons Petre in Essex, England. Queen Elizabeth I spent several nights there in 1561. (Strong 265). 12. Marcus Gheeraerts the Younger, Unknown Lady (Mary Rogers, Lady Harington), 1593, oil on panel, 114.3 x 94 cm, Tate (purchased 1974). The identity for the sitter is speculative, although her age (23 years old) is inscribed. 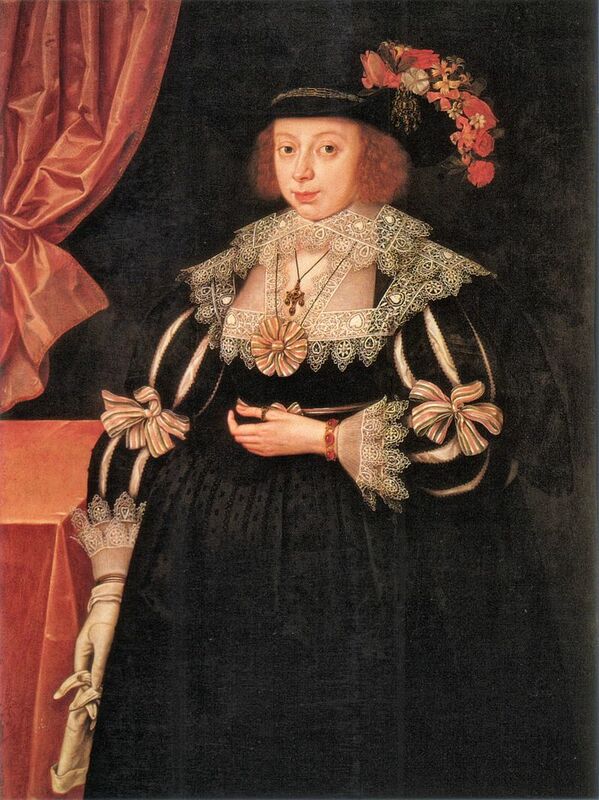 It is one of the earliest known portraits by Gheeraerts. (Strong 266). 12a. 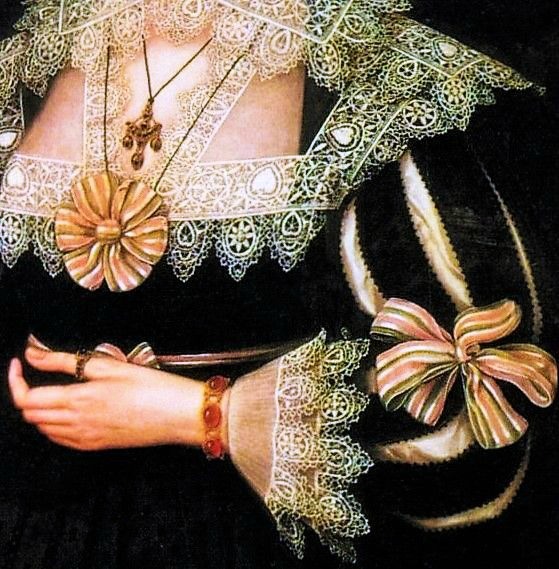 Detail, Unknown Lady (Mary Rogers, Lady Harington), 1593. 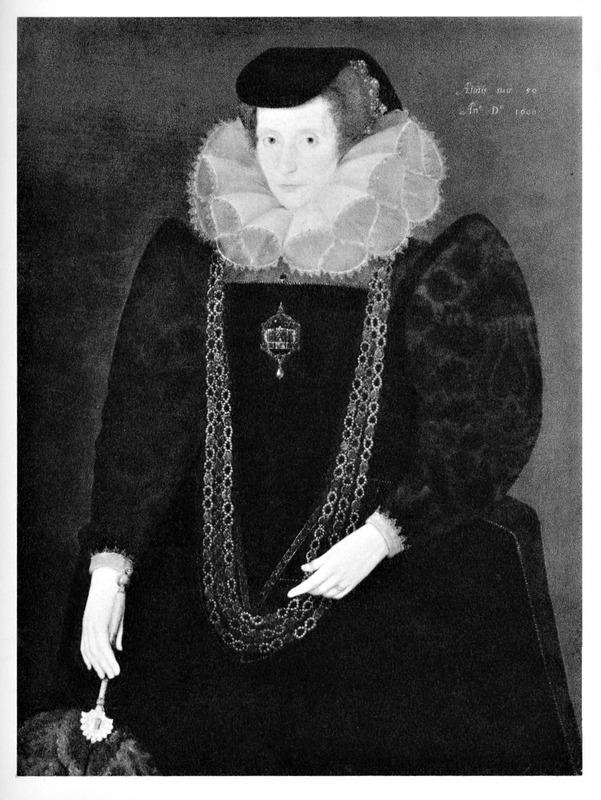 The sitter is identified in part by the clothes she wears: the distinctive black and white pattern on her dress heralds the Harington coat of arms. 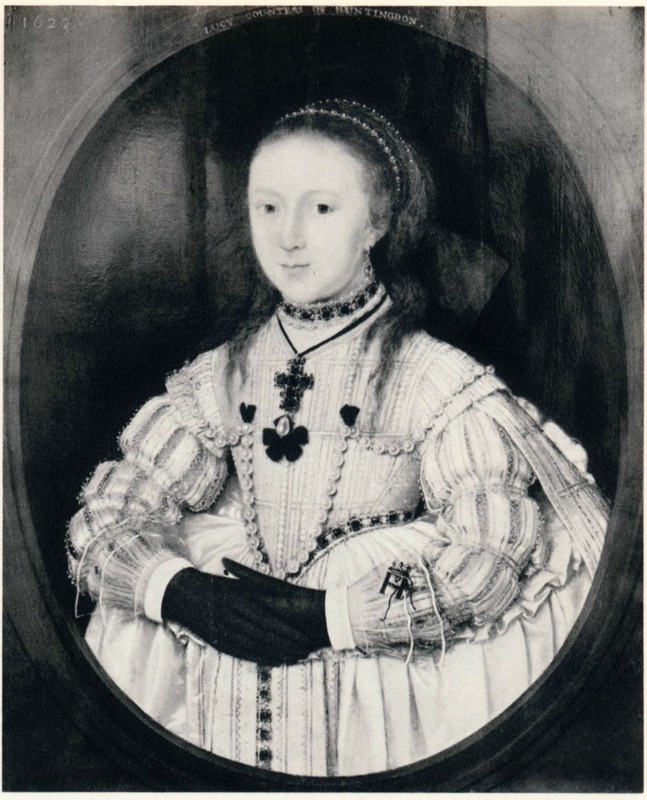 The sitter is 23 years old and her portrait may have been painted in connection with a visit to Kelston (The Harington homestead) in 1592 by Queen Elizabeth. The Latin inscription in the painting reads, “I may neither make nor break” a dramatic phrase whose meaning is no longer clear. 13. Marcus Gheeraerts the Younger, Captain Thomas Lee in Irish Dress, oil on canvas, 1594 (purchased 1980), Tate Britain. (Strong 267). 13a. Detail, Marcus Gheeraerts the Younger, Captain Thomas Lee in Irish Dress, oil on canvas, 1594, Tate Britain. 14. Marcus Gheeraerts the Younger, Sir Francis Drake, 1594, oil on canvas, 137.1 x 114.3 cm, private collection. Knighted by Queen Elizabeth in 1581, Sir Francis Drake, vice admiral (c. 1540 – 1596), circumnavigated the globe in a single expedition between 1577 and 1580. 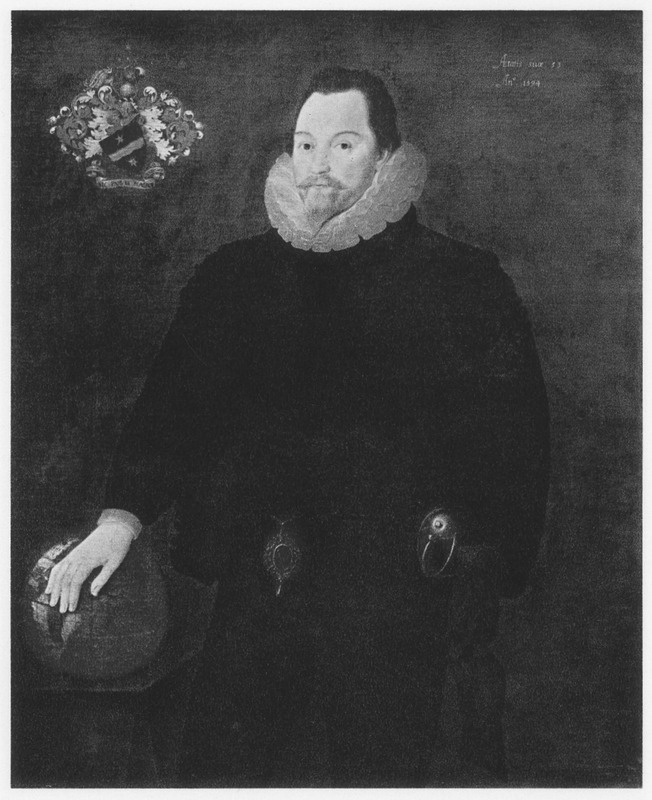 Drake was second-in-command of the English fleet against the Spanish Armada in 1588. Though he opened up the Pacific Ocean to European trade, Drake’s seafaring career ended in his mid-fifties when he died of dysentery following a failed attack on Spain’s Puerto Rico in 1596. (Strong 268). 15. 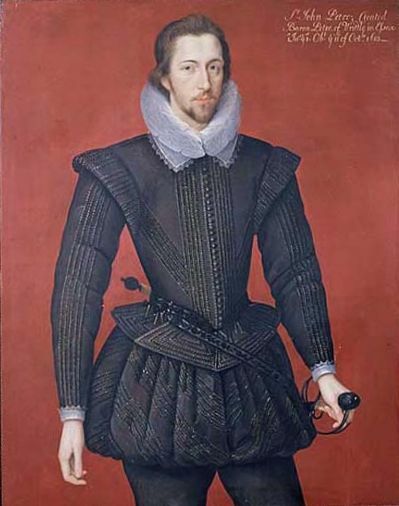 Marcus Gheeraerts the Younger, Unknown Man (Called the Earl of Southampton), 1599, location unknown. (Strong 269). 16. Marcus Gheeraerts the Younger, Unknown Lady, 1600, oil on panel, The Lord Talbot de Malhide. (Strong 270). 17. Marcus Gheeraerts the Younger, Sir Henry Lee, oil on canvas, 1600, private collection on loan since 2008 to Tate Britain. 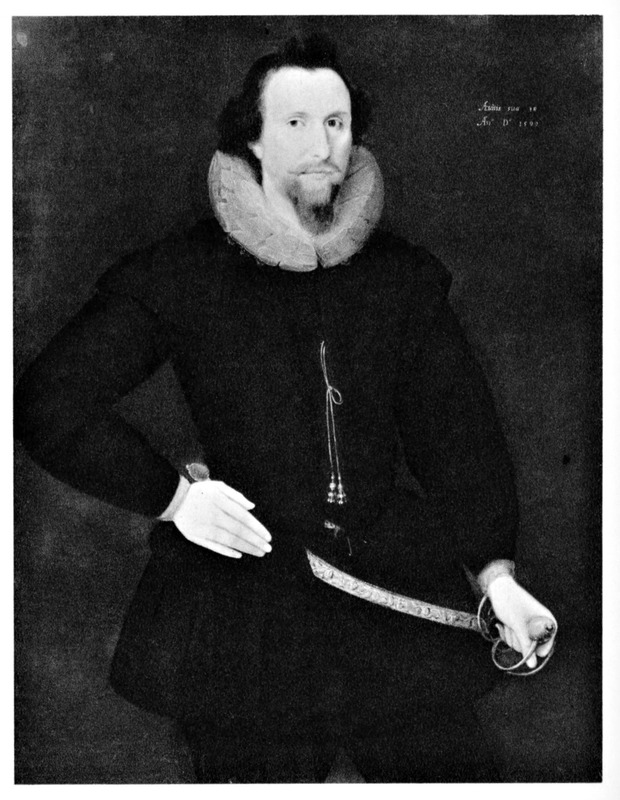 Sir Henry Lee (1533–1611) was a Tudor Court favorite under Elizabeth I, appointed as Queen’s Champion and Master of the Armoury. 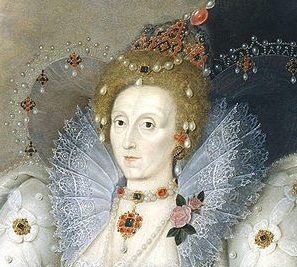 Sir Henry organised the annual public Accession Day festivals in honor of the queen and commissioned the famous Ditchley portrait of Elizabeth I by Gheeraerts for his house at Ditchley in Oxfordshire. In 1597 he was made a Knight of the Garter and in the painting wears that order’s gold chain and bejeweled medal of St George slaying the dragon. (Strong 271). 18. Marcus Gheeraerts the Younger, Sir Henry Lee in Garter Robes, 1602, oil on canvas, 216.2 x 137.2 cm. Always at Ditchley until 1933. Today at The Armourers & Brasiers’ Company of the City of London. Founded in 1322, the livery company was awarded its first Royal Charter in 1453 from King Henry VI. In 1708 the Armourers joined with the Brasiers and received its current charter from Queen Anne. (Strong 272). 18a. 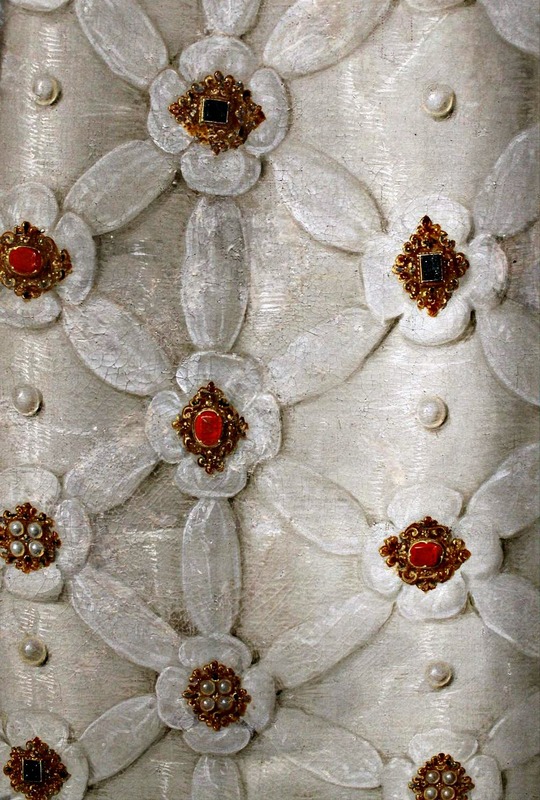 Detail, Sir Henry Lee in Garter Robes, 1602. 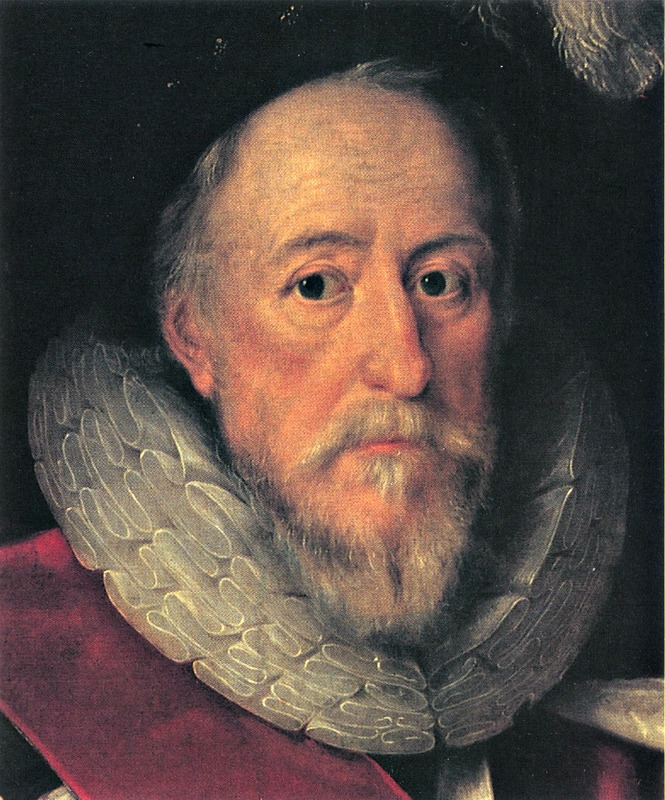 One of Gheeraerts II’s finest portraits, Sir Henry Lee is a former man of action, whose old head is remarkably shrewd. 19. Marcus Gheeraerts the Younger, Christophe de Harlay, Comte de Beaumont, 1605, oil on canvas, The Marquess of Salibury. The Comte de Beaumont was the French ambassador to England at a time when the Kings of England and France were looking in their own ways for a diplomatic solution to the religious controversies in Europe. 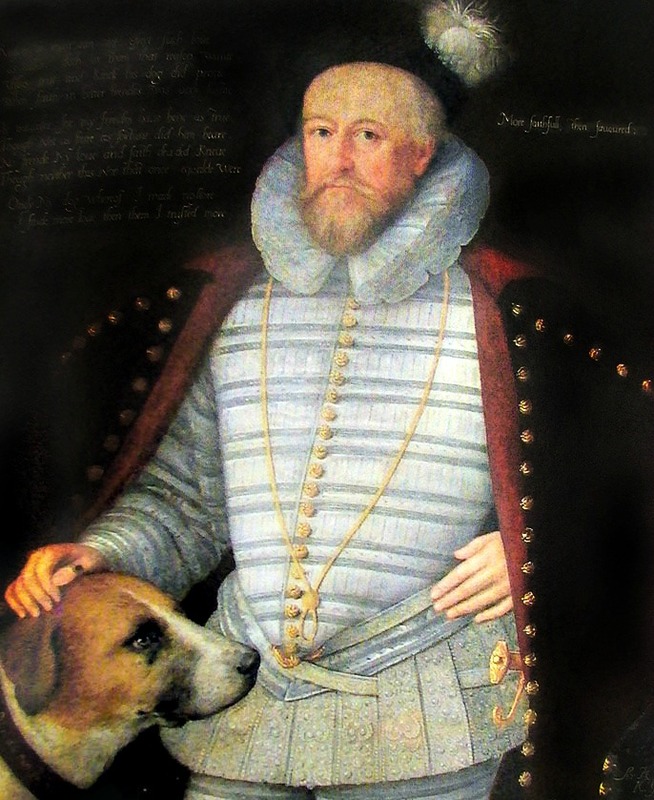 The painting was made for Robert Cecil, 1st Earl of Salisbury, a politician who had won James I’s trust. (Strong 273). 20. Marcus Gheeraerts the Younger, Alexander Seton 1st Earl of Dunfermline, 1606. 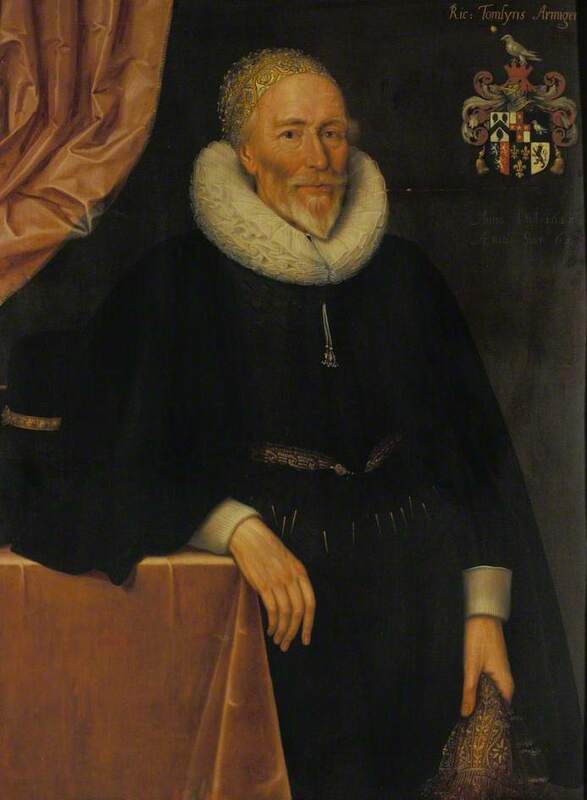 Alexander Seton, 1st Earl of Dunfermline (1555–1622), a Scot, was regarded as one of the finest legal minds of his time. 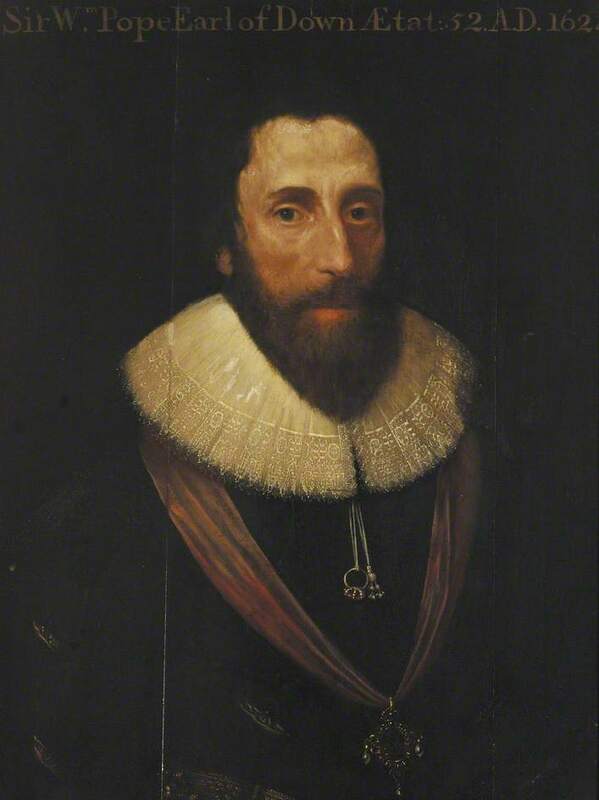 Seton served as Lord President of the Court of Session (top judge) from 1593 to 1604, Lord Chancellor of Scotland (top presiding officer of state) from 1604 to 1622 and Lord High Commissioner to the Scottish Parliament. (Strong 274). 21. 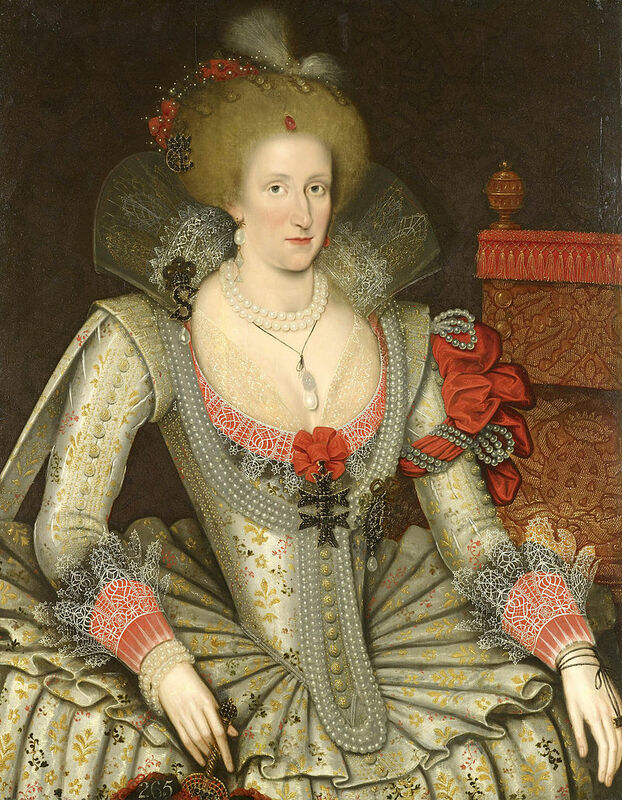 Marcus Gheeraerts the Younger, Anne of Denmark, 1614, oil on panel, 109.4 x 87.3 cm, Windsor Castle. Anne married a future James I of England in 1589 at age 15. The Queen consort bore James three children who survived infancy, including the future Charles I (reigned 1625-1649). Once fascinated with his bride, observers regularly noted incidents of marital discord between the dour and ambitious James and his independent and self-indulgent wife. Before she died in 1619 the royal couple led mainly separate lives. (Strong 275). 22. Marcus Gheeraerts the Younger, Ulrik, Duke of Schleswig-Holstein, 1614, oil on canvas, 211.2 x 114.3 cm, The Duke of Bedford. Prince Ulrik of Denmark, (1578 – 1624) was the second son of King Frederick II of Denmark and his consort, Sophie of Mecklenburg-Güstrow. 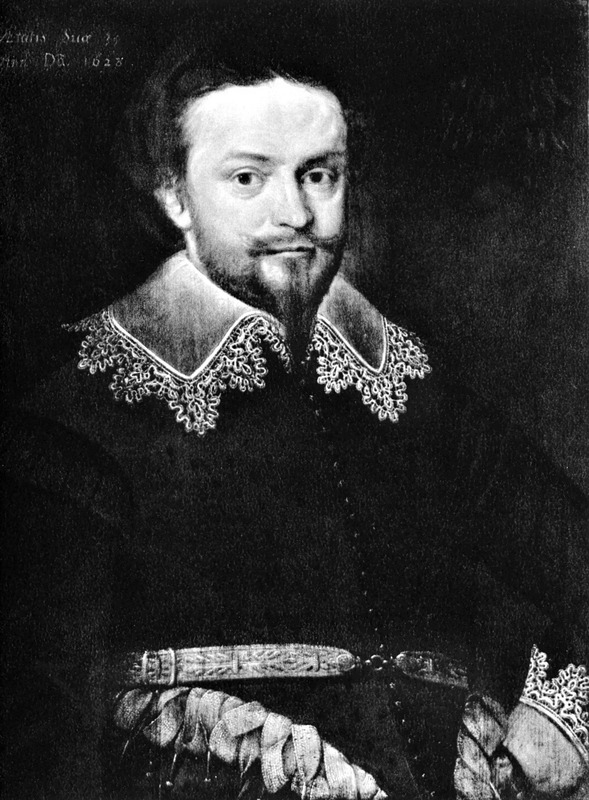 As second-born Ulrick bore the merely titular rank of Duke of Holstein and Schleswig although he later became Administrator of Schwerin. After his sister Anne became Queen of England, Ulrik was godfather to Princess Mary. (Strong 276). 23. 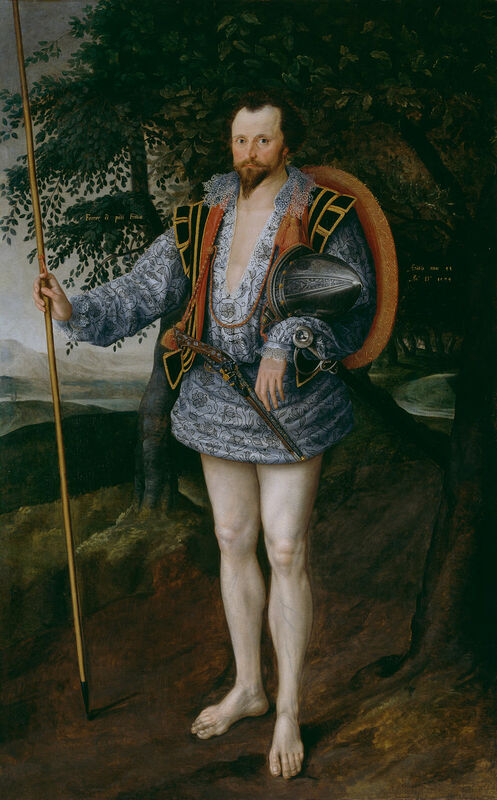 Marcus Gheeraerts the Younger, Sir John Kennedy, oil on canvas, 1614, The Duke of Bedford. Immediately after James I’s accession Elizabeth Brydges – Maid of Honour of Queen Elizabeth I – married Sir John Kennedy, one of the king’s Scotch attendants, at Sudeley Manor, Gloucestershire, England. Chandos appears to have opposed the match, and it was rumored early in 1604 that Kennedy had a wife living in Scotland. But James I wrote to Chandos (19 Feb 1603/4) entreating him to overlook Sir John’s errors because of his own love for his attendant. Elizabeth apparently left her husband and desired to have the matter legally examined, but as late as 1609 the lawfulness of the marriage had not been decided upon. Lord Chandos declined to aid his cousin, and Sir John Kennedy’s wife died deserted and in poverty in 1617. (Strong 277). 24. Marcus Gheeraerts the Younger, Catherine Killigrew, Lady Jermyn, 1614, oil on panel, 73.7 x 57.2 cm, Yale Center for British Art. (Strong 278). Catherine Killigrew was 35 years old when she sat for this portrait. The wife of a MP, and mother of three children, Catherine was the daughter of Sir William Killigrew (d. 1622) who was a courtier to Queen Elizabeth I and to King James I. Sir William served as Groom of the Privy Chamber. (Strong 278). 25. 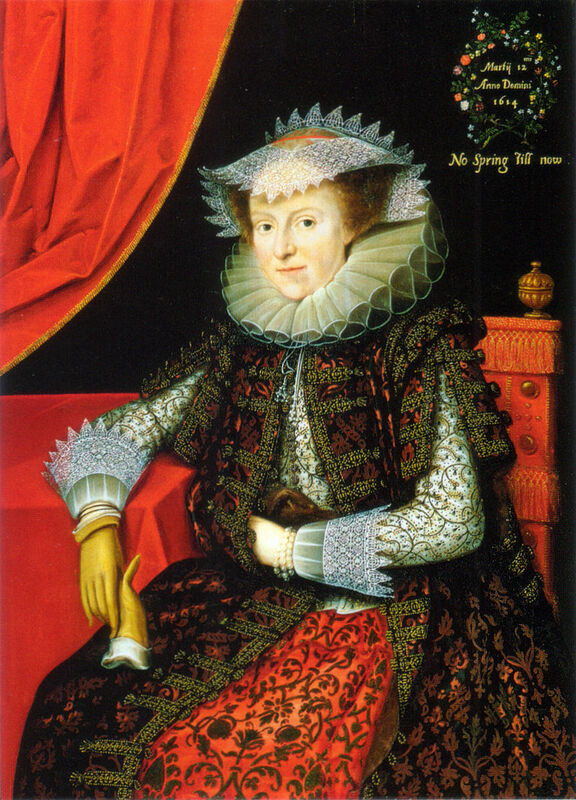 Marcus Gheeraerts the Younger, Probably Mary (née Throckmorton), Lady Scudamore, oil on panel, 1615, 45 in. x 32 1/2 in. (1143 mm x 826 mm), National Portrait Gallery, London, purchased 1859. 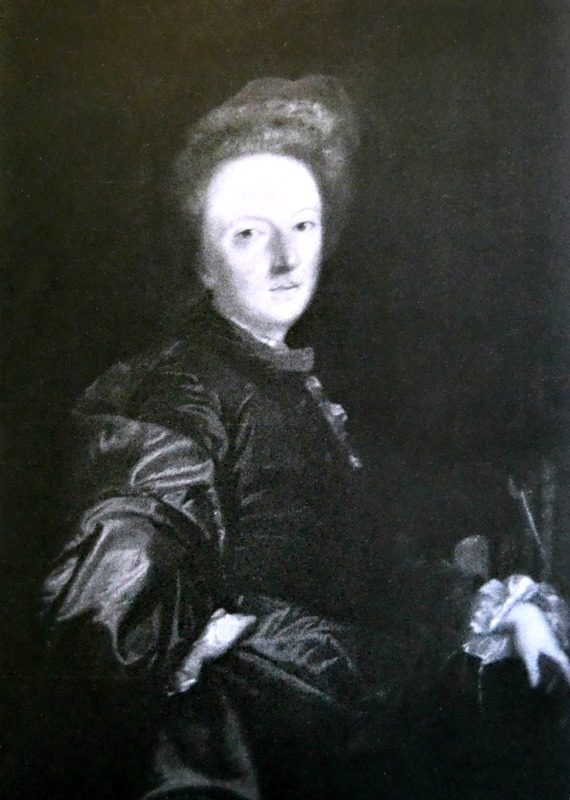 The sitter, once identified wrongly as the Countess of Pembroke, is probably Lady Scudamore about whom little is known. The portrait is likely for the occasion of her son’s marriage (John, later Viscount Scudamore) to Elizabeth Porter of Dauntsey, Wiltshire. The inscribed motto ‘No Spring Till now’, and wreath of flowers suggest the hope that this marriage must have represented within the family. (Strong 279). 26. Marcus Gheeraerts the Younger, Sir Henry Savile, 1621, 216.2 x 127 cm, Bodleian Library, Oxford. Gift from the sitter’s widow, 1622. 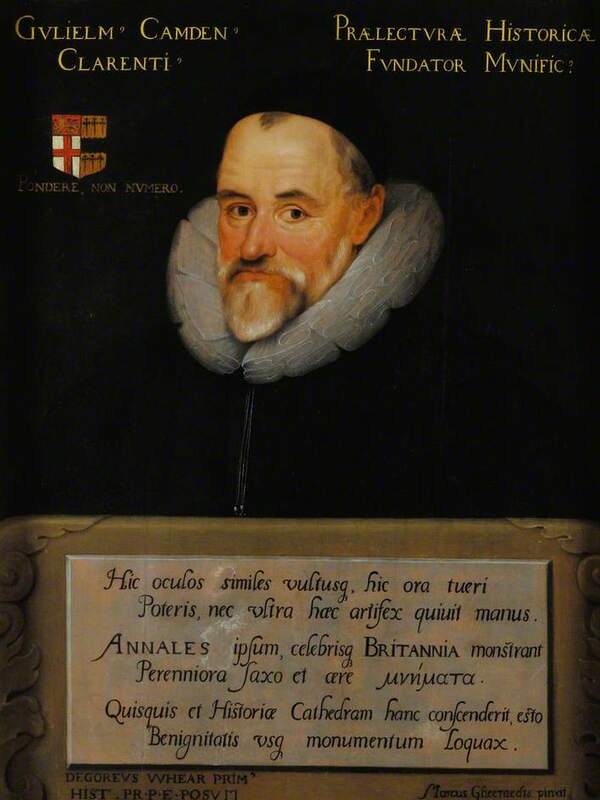 Sir Henry Savile (1549-1622) was an enterprising Bible scholar. When he did not qualify for the role of Provost of Eton, he had Queen Elizabeth I waive the college’s rules for him. As Warden of Merton – a post secured with the help of influential friends – he was unpopular with students and faculty but the college itself flourished. 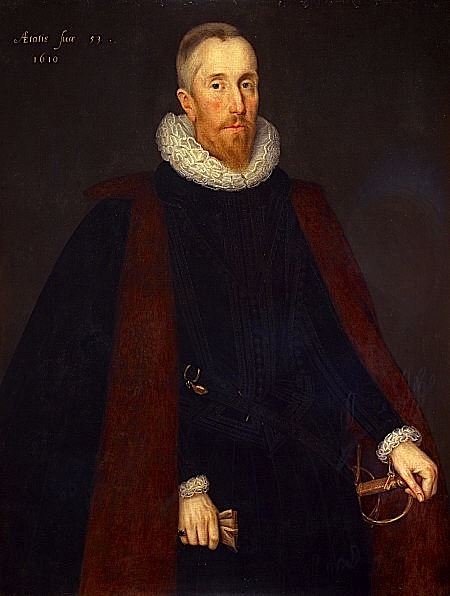 Sir Henry’s brother was a powerful lawyer who helped guide his brother’s career which included knighthood in 1604. (Strong 280). 27. Marcus Gheeraerts the Younger, Sir Henry Savile, 1621, oil on canvas, 1621, 203.7 x 122 cm, Eton College. A second smaller copy of Bible scholar and administrator Sir Henry Savile. (Strong 281). 29. Marcus Gheeraerts the Younger, Charles Hoskins, 1629, oil on panel, 66.1 x 52.7 cm, Jack Hoskins Master. Esq. (Strong 283). 30. Marcus Gheeraerts the Younger, Lady in Fancy Dress (The Persian Lady), 1590s, oil on panel, 216.5 x 135.3 cm, Hampton Court. first recorded in the collection of Queen Anne but believed to be part of the Royal Collection before that time. In the cartouche a sonnet reads: “The restless swallow fits my restless minde, Instill revivinge still renewinge wronges; her Just complaintes of cruelty unkinde, are all the Musique, that my life prolonges. With pensive thoughtes my weeping Stagg I crowne whose Melancholy teares my cares Expresse; hes Teares in sylence, and my sighes unknowne are all the physicke that my harmes redresse. My only hope was in this goodly tree, which I did plant in love bringe up in care: but all in vaine, for now to late I see the shales be mine, the kernels others are. My Musique may be plaintes, my physique teares If this be all the fruite my love tree beares.” Portrait of a Woman is a good example of Elizabethan allegorical portraiture. Importantly, the painting may be related to the Ditchley portrait of Elizabeth I (Strong 285) as well as the portrait of Captain Thomas Lee (Strong 267 ). 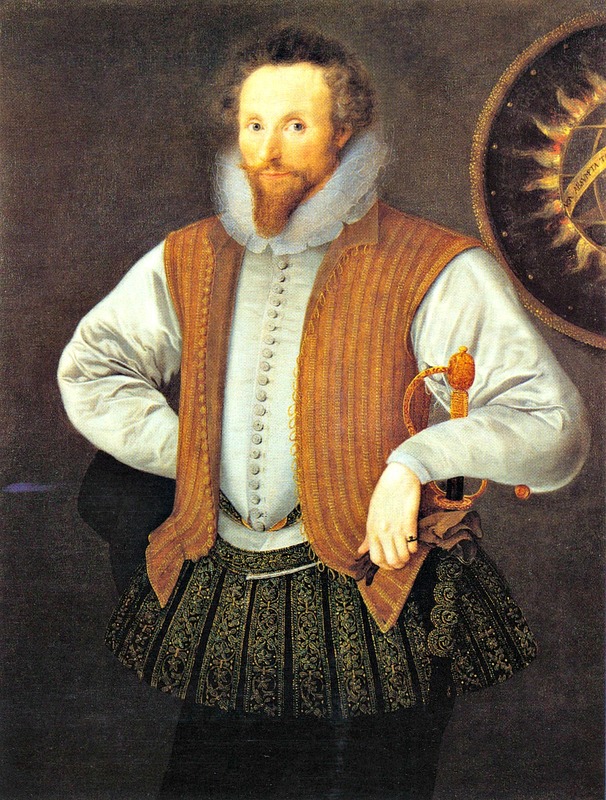 How may these three portraits be connected to an entertainment given by Sir Henry Lee, the Queen’s Master of the Armouries and Champion of the Tilt, when the Queen visited Ditchley in 1592? (Strong 284). 31. 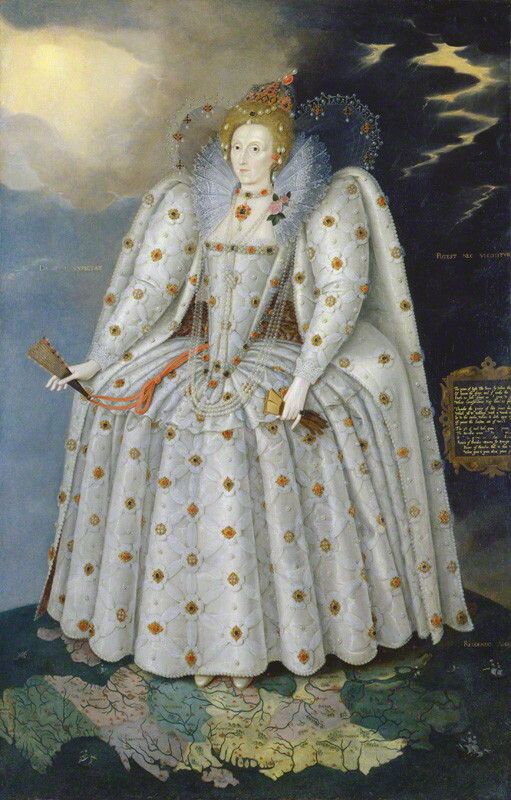 Marcus Gheeraerts the Younger, Queen Elizabeth I (“The Ditchley Portrait”), oil on canvas, 1592, 95 in. x 60 in. (2413 mm x 1524 mm). National Portrait Gallery, London. Bequeathed by Harold Lee-Dillon, 17th Viscount Dillon, 1932. Queen Elizabeth was nearly 60 years old when this portrait was made. It is traditionally understood to have been painted on the Queen’s visit to Ditchley, the timber-framed family house set in north Oxfordshire wooded farmland of Sir Henry Lee (1533-1611). Like John II Walshe (d.1546/7) of Little Sodbury, Gloucestershire, who was King’s Champion to Elizabeth’s father Henry VIII, Henry Lee served at that standard for Queen Elizabeth from 1570 until his retirement about two years before this painting was made. Ditchley once provided lodging and access to the royal hunting ground of Wychwood Forest. (Strong 285). 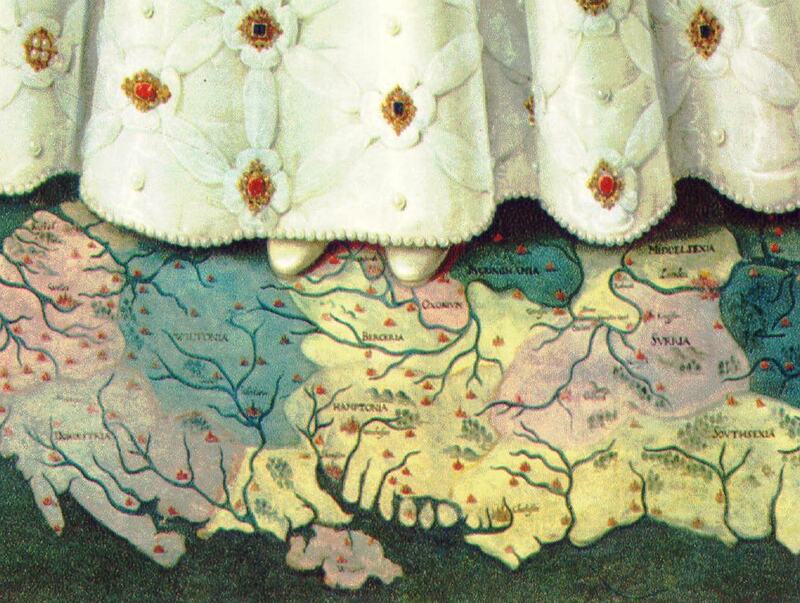 Queen Elizabeth I is standing on a map of England. Detailed study of the beautiful garment and accessories. 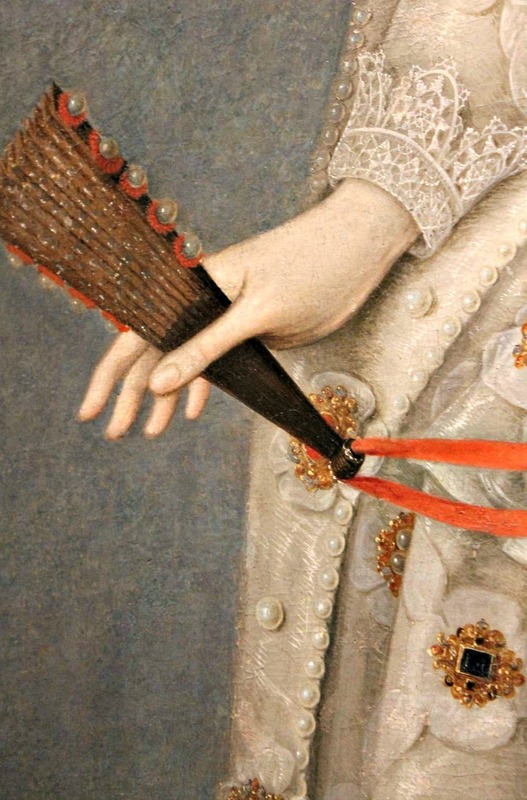 Detail of garment and accessories in The Ditchley Portrait. A bejeweled fan in Queen Elizabeth I’s right hand. Detail from The Ditchley Portrait of 1592 by Marcus Gheeraerts the Younger. 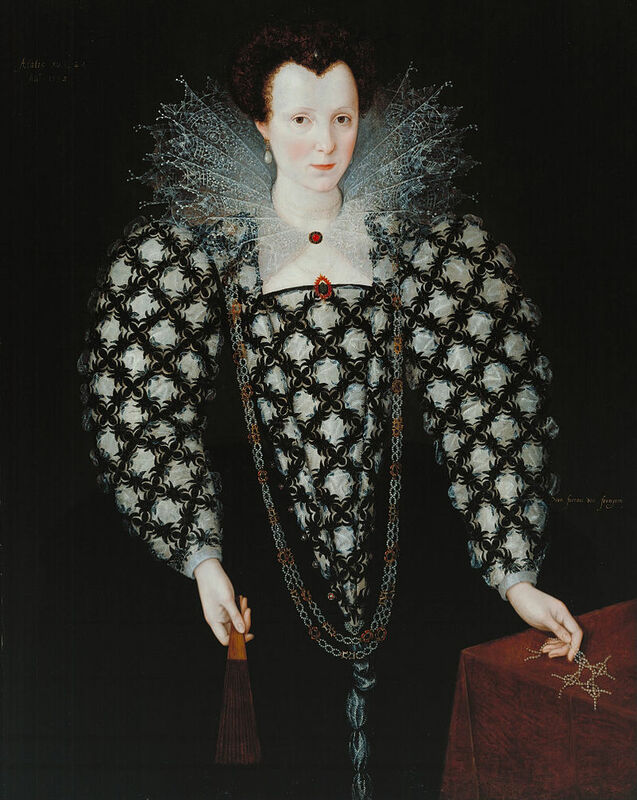 In the decade before The Ditchley Portrait the artist’s father, Gheeraerts the Elder, had painted a full- length oil on panel portrait of Elizabeth I. In the ensuing handful of years practical technical innovation in art is in evidence in the Elizabethan court: for the son’s oil portrait of the same royal personage was produced on canvas on a much larger scale. 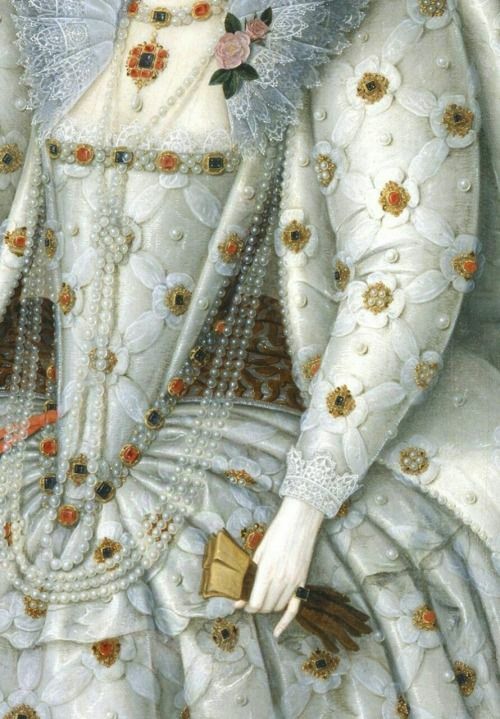 Queen Elizabeth I. Ditchley portrait detail. The three fragmentary Latin inscriptions in the painting have been interpreted as: “She gives and does not expect”; “She can, but does not take revenge”; and, “In giving back, she increases.” An inscribed sonnet, whose author is not known, takes the sun as its subject. At some later date the canvas was cut more than 7 centimeters fragmenting the final words of the each line. 32. Marcus Gheeraerts the Younger, Sir Henry Lee, 1590s, oil on canvas, 117 x 86.4 cm, The Ditchley Foundation. Always at Ditchley. The painting and inscribed verses memoralize an incident where Bevis – Lee’s dog – saved his master’s life. “More faithfull then favoured…” (Strong 286). 33. Marcus Gheeraerts the Younger, Michael Dormer, mid 1590s, oil on canvas, 122 x 91.5 cm, J.C. H. Dunlop, Esq. There are Latin inscriptions which surround and are written across the globe and shield. (Strong 287). The world of Sir Henry Lee bears down again on the young artist’s portrait of Michael Dormer, an Oxfordshire neighbor to Sir Henry. 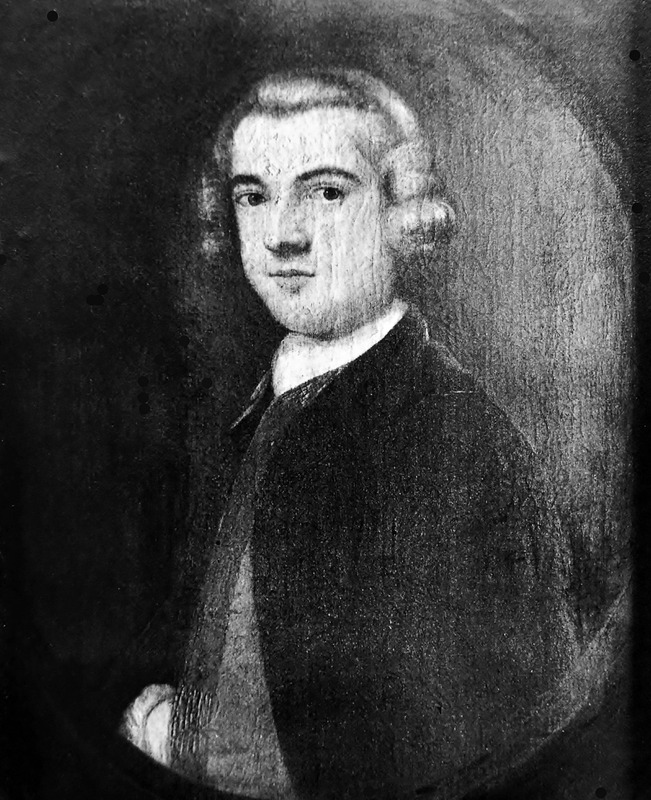 In Dormer’s three-quarter-length portrait, the right hand is posed similarly to Thomas Lee’s portrait. As that portrait is the ostensible centerpiece of this discussion, we have traveled full circle through Gheeraerts II’s verifiable portraiture in Elizabethan and Jacobean England. Here then concludes the complete collection of Marcus Gheeraerts the Younger’s signed and dated works (Strong 255-262); inscribed and dated works (Strong 266-283); and, inscribed and undated works (Strong 284-287). Not included here are works dated and attributed to the artist (Strong 288-294) and attributed and undated (Strong 295-313). 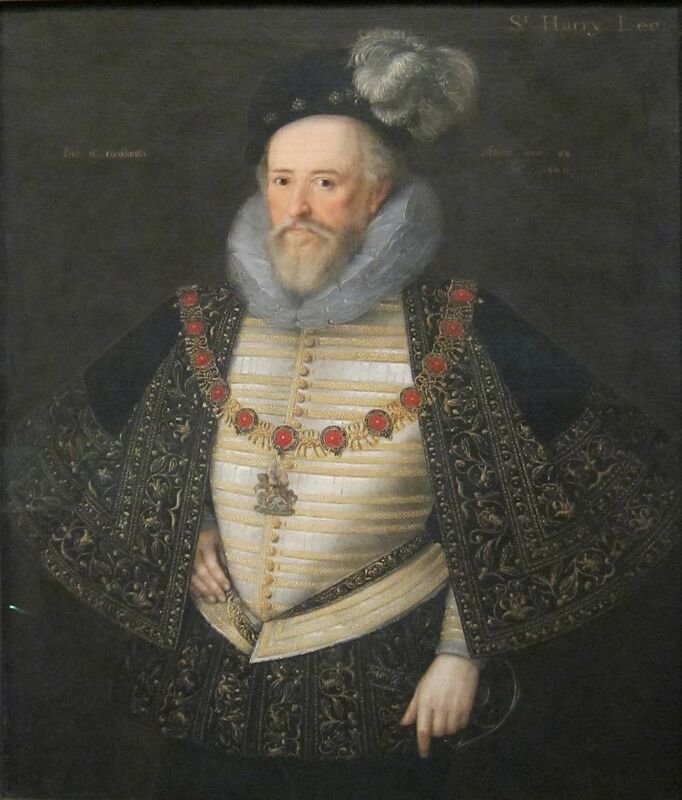 The last group includes several well-known portraits including William Cecil, Lord Burghley, c. 1595, in the National Portrait Gallery (Strong 295) and Robert Devereux, 2nd Earl of Essex, c. 1596, in collection of the Duke of Bedford. (Strong 300). 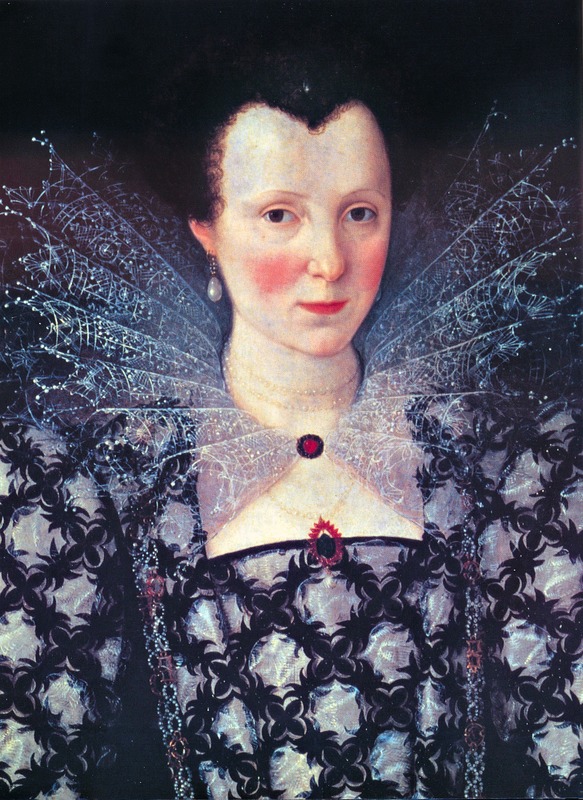 Strong 255 – Hearn, Karen, Marcus Gheeraerts II, Elizabethan Artist (In Focus series), Tate Publishing, 2002, p. 29. STRONG 285 – John II Walshe (d.1546/7) of Little Sodbury, Gloucestershire, was King’s Champion at the coronation of Henry VIII in 1509 and was a great favorite of the young king’s. Transactions of the Bristol & Gloucestershire Archaeological Society, Vol.13, 188/9, pp. 1–5, Little Sodbury”. Bgas.org.uk. Archived from the original on March 16, 2012. Retrieved 2012-03-19; Sir H Lee – Butler, Katherine (2015). Music in Elizabethan Court Politics. Woodbridge: Boydell and Brewer. pp. 129–42. ISBN 9781843839811.; Ditchley once provided lodging and access to the royal hunting ground of Wychwood Forest. – timber-framed family house in classic north Oxfordshire wooded farmland, – https://web.archive.org/web/20070404233018/http://www.ditchley.co.uk/page/37/ditchley-park.htm; Inscriptions – http://www.npg.org.uk/collections/search/portrait/mw02079/Queen-Elizabeth-I-The-Ditchley-portrait#description; http://npg.si.edu/exhibit/britons/briton1.htm; Hearn, Karen, Marcus Gheeraerts II, Elizabethan Artist (In Focus series), Tate Publishing, 2002, p. 31. 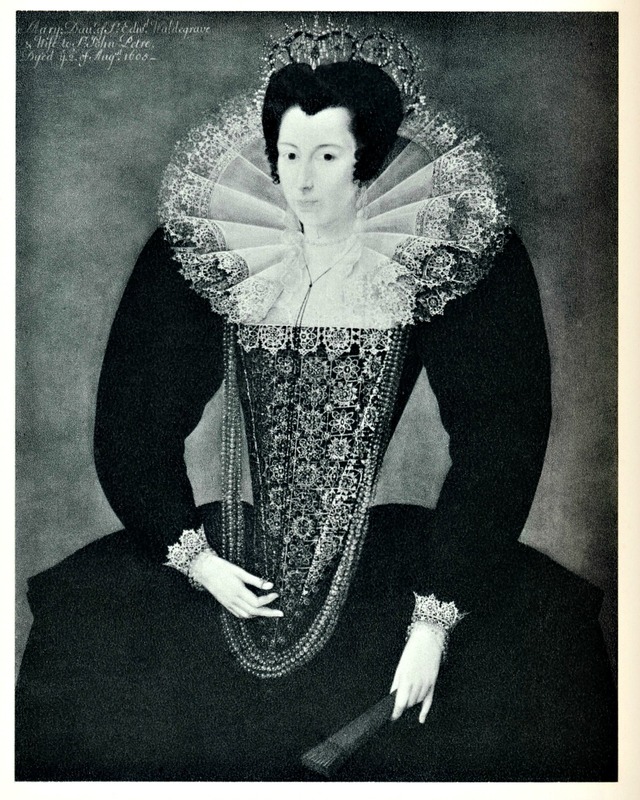 STRONG 287 – Hearn, Karen, Marcus Gheeraerts II, Elizabethan Artist (In Focus series), Tate Publishing, 2002, p. 24. This entry was posted in Art, ARTIST, British art, Marcus Gheeraerts the Younger, Portraits and tagged architecture, Barbara Gamage Countess of Leicester, Christophe de Harlay Comte de Beaumont, Elizabeth Cherry Lady Russell, Katherine Somerset Lady Petre, Louis Frederick Duke of Württemberg, Lucy Davis Countess of Huntingdon, Marcus Gheeraerts the Younger; Elizabethan and Jacobean Portraiture; Ditchley Portraits; Queen Elizabeth I; Sir Henry Lee; Captain Thomas Lee; The English Icon; Roy Strong;, Michael Dormer, Sir Francis Drake, Sir John Kennedy, Sir William Russell, Ulrik Duke of Schleswig-Holstein, William Herbert 3rd Earl of Pembroke on May 28, 2017 by jwalsh2013. Joshua Reynolds: “Amelia Watts,” 1745. 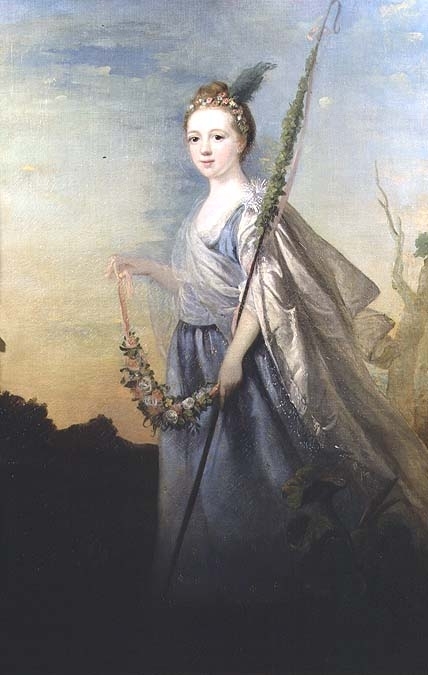 17 – “Amelia Watts,” 1745, 155 x 102 cm, Private Collection. Family tradition identifies this as a young girl who married in 1769 and died in childbirth soon after. This entry was posted in Art, ARTIST, British art, Joshua Reynolds, Portraits and tagged Amelia Watts 1745 on February 11, 2016 by jwalsh2013. Joshua Reynolds: Sir William Morice, 3rd Bt, 1745. 16-Sir William Morice, 3rd Bt (c.1707-1750) 1745, 123 x 99 cm, St. Michael’s Mount, Cornwall. Sir William had his portrait painted by an artist other than Reynolds when Sir William traveled to Italy in 1729 and 1730. In Italy Sir William bought art – mainly Canalettos. In 1731 he married Lady Lucy Wharton but seven years later they divorced. In 1741 Anna Bury became his wife. Reynolds paints Sir William wearing a brownish silk tunic and grey cloak with a red velvet hat lined in fur. This entry was posted in Art, ARTIST, British art, Joshua Reynolds, Portraits and tagged Sir William Morice 3rd Bt 1745 on February 11, 2016 by jwalsh2013. 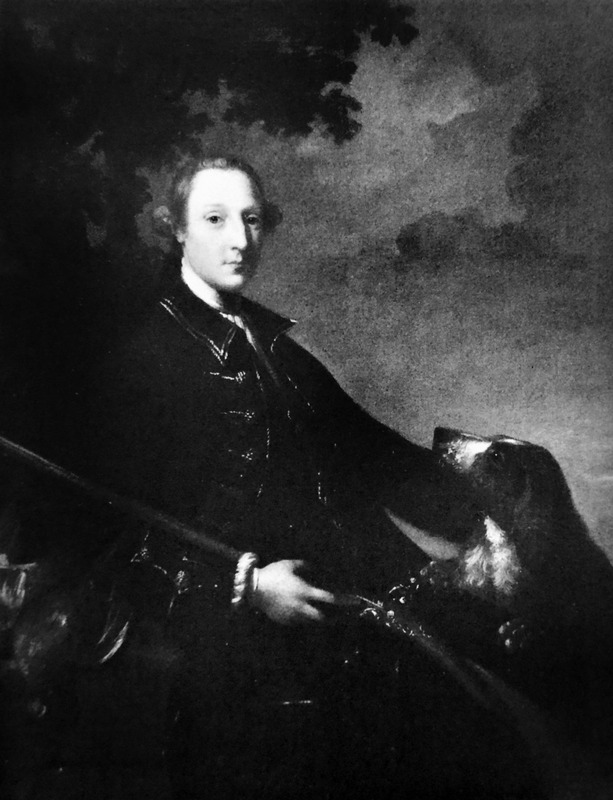 Joshua Reynolds: Clotworth Skeffington, later 1st Earl of Massereene, 1744-46. 15- Clotworth Skeffington, later 1st Earl of Massereene (1714-1757), 1744-46, 121.3 x 96.5 cm, Private Collection. Clotworth Skeffington’s portrait was perhaps painted in London and was Reynolds’s most ambitious painting to date. This entry was posted in Art, ARTIST, British art, Joshua Reynolds, Portraits and tagged Clotworth Skeffington 1744-46 on February 5, 2016 by jwalsh2013. Joshua Reynolds: Richard Parsons, 2nd Earl of Rosse, 1744-46. 14-Richard Parsons, 2nd Earl of Rosse (c.1718-1764), 1744-46, 127 x 102 cm, private collection. Rosse was an Irish peer and this portrait was likely painted in London. He married Olivia Edwards in 1754. The composition is derived from a portrait of James Stuart, Duke of Richmond and Lennox, c. 1634–35 by Anthony van Dyck (Flemish, 1599–1641) that is today at the Metropolitan Museum of Art in New York. This entry was posted in Art, ARTIST, British art, Joshua Reynolds, Portraits and tagged Richard Parsons 2nd Earl of Rosse 1744-46 on February 5, 2016 by jwalsh2013. Joshua Reynolds: Mrs. Foote, 1744-45. 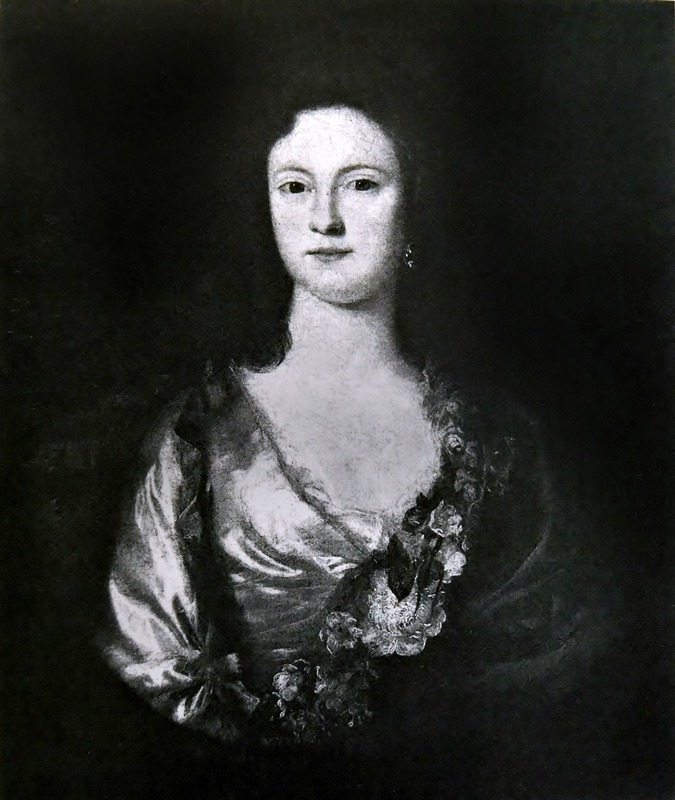 13- Mrs. Foote, 1744-45, 76 x 63.3 cm, private collection. Wife to Reverend Josiah Foote, Rector of Antony and Kingsteignton in South Devon. 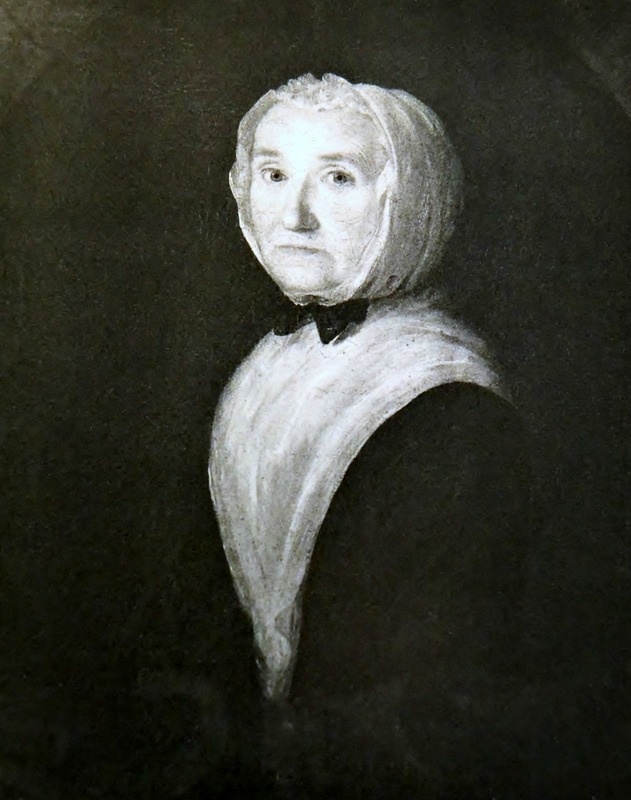 Mother of Captain John Foote. This entry was posted in Art, ARTIST, British art, Joshua Reynolds, Portraits and tagged Mrs. Foote 1744-45 on February 5, 2016 by jwalsh2013. Joshua Reynolds: Edward Eliot, 1st Lord, 1744-45. 12-Edward Eliot, 1st Lord (1727-1804), 1744-45, 76 x 63 cm, Trustees of the St Germans Estate, Port Eliot, Cornwall. Edward Eliot was MP for Cornwall and lifelong friend of the artist. Described as lively, most agreeable and very clever, he was a pall-bearer at Reynolds’ funeral nearly half a century after this portrait was painted. This entry was posted in Art, ARTIST, British art, Joshua Reynolds, Portraits and tagged Edward Eliot 1st Lord 1744 on February 5, 2016 by jwalsh2013. Joshua Reynolds: MRS. KERLEY, 1744. 11-Elizabeth Murray married John Kerley, a town official of Plymouth. Their son became a captain in the Royal Navy. This entry was posted in Art, ARTIST, British art, Joshua Reynolds, Portraits and tagged Mrs. Kerley 1744 on February 5, 2016 by jwalsh2013.